04/02/2019: Added Williams 1/4-Drive Sockets from No. 1269 Set. 04/01/2019: Minor reorganization, renumbered figures. 03/31/2019: Added a Williams No. 1269 1/4-Drive Socket Set and a Williams ST-1232 1/2-Drive Socket. 03/30/2019: Added Williams 9/32-Drive Sockets from M-310 Set. 03/28/2019: Added Williams 5/16-Hex Drive Sockets from No. 287 Set and a Williams No. 1288P 9/32-Drive Socket Set. 03/27/2019: Major reorganization of sections, added a Williams-Husky No. 287 Socket Set, a Placeholder for Williams 1269 Socket Set, and Williams No. 1519 Ignition Pliers. 03/26/2019: Added a Williams 1128 7/16x7/16 Ignition Wrench and a Williams 1108A 1/4x5/16 Ignition Wrench. 03/25/2019: Reorganized 1/4-drive section, added a Williams 1112 3/16x3/16 Ignition Wrench, a Williams NM-20A 1/4-Drive Sliding Tee Handle, and Williams No. 1519 Ignition Pliers. 03/24/2019: Added a Williams 1120 5/16x5/16 Ignition Wrench and a Williams 1122 11/32x11/32 Ignition Wrench. 03/23/2019: Added a Williams 1118 9/32x9/32 Ignition Wrench, a Williams 1132 1/2x1/2 Ignition Wrench, and a Catalog Listing for Williams B-315 Set. 01/26/2019: Added a Williams 7033C Box Wrench. 01/25/2019: Added a Williams 7034A Duohex-Box Wrench. 01/24/2019: Added a catalog listing of "Volume" wrenches. 01/31/2016: Added a Williams 1162 Combination Wrench. 01/27/2016: Added a Williams 1124 Ignition Wrench. 01/18/2016: Added a Williams 1040 Open-End Wrench. 01/15/2016: Added a Williams 9725B Offset Box Wrench. 01/11/2016: Added a Williams 4731A Box Wrench. 01/08/2016: Added a Williams 1090 Tappet Wrench. 01/05/2016: Added a Williams 1520 Waterpump Pliers. 01/03/2016: Added a Williams 83B S-Shaped Open-End Wrench. 01/01/2016: Added a Williams 7033C Duohex-Box Wrench. 12/30/2015: Added a Williams 1990 Brake Wrench. 12/29/2015: Reorganized discussion of manufacturing dates. 12/28/2015: Added a Williams 92 Tappet Wrench. 12/26/2015: Added a Williams 1737 Open-End Wrench. 12/11/2015: Added a Williams A1725 Ribbed-Style Open-End Wrench. 12/10/2015: Added a Williams 990 Brake Adjustment Wrench. 12/04/2015: Added a Williams 1094 Tappet Wrench. 01/24/2012: Added a Williams 1122 Ignition Wrench. 01/04/2012: Added a Williams 7727 Transitional Duohex-Box Wrench. 12/21/2011: Added a Chrome-Alloy (Williams) 18733C Offset Box Wrench. 12/15/2011: Added a Williams 7731A Transitional Duohex-Box Wrench. 12/14/2011: Added a Williams A1733 Ribbed-Style Open-End Wrench. 12/13/2011: Added a Williams 8030 Panelled Offset Box-End Wrench. 12/12/2011: Added a Williams 1035 Ribbed-Style Open-End Wrench. 12/11/2011: Added a Williams 8729 Offset Box Wrench. 12/06/2011: Added a Williams A1729 Ribbed-Style Open-End Wrench. 12/02/2011: Added a Williams 9725B Short Offset Box-End Wrench. 11/26/2011: Added a Williams 1736A Open-End Wrench. 11/19/2011: Added a Williams A1723 Open-End Wrench. 11/02/2011: Added a Williams 1322 Open-Flare Wrench. 10/10/2011: Added a Williams 8940 Water-Pump Wrench. 09/05/2011: Added a Williams A1735 Ribbed-Style Open-End Wrench. 08/28/2011: Added a Williams 2727 Obstruction Wrench. 07/31/2011: Added a Williams A1029 Ribbed-Style Open-End Wrench. 06/19/2011: Added a Cromal 19723 Short Offset Box Wrench. 06/12/2011: Added a Williams 7723 Panelled Box-End Wrench. 06/10/2011: Added a Williams 2031 Obstruction Wrench. 06/07/2011: Added Williams PL-6 Combination Pliers. 06/04/2011: Added a Williams 1164 Combination Wrench. 05/29/2011: Added a Williams 8942 Water-Pump Wrench. 05/06/2011: Added a Williams 1033 Open-End Wrench. 04/27/2011: Added a Williams Early 1033C Open-End Wrench. 04/24/2011: Added a Williams A1033A Ribbed-Style Open-End Wrench. 04/19/2011: Added a Williams F-50A Refrigeration Ratchet. 04/16/2011: Added a Williams NX-50 1 Inch Hex Drive Ratchet and a Williams R-19A Refrigeration Socket set. 04/11/2011: Added a Williams 679A "A.L.A.M." S-Shaped Wrench. 04/07/2011: Added a Williams 729 Open-End Wrench. 04/06/2011: Added a Williams Early 1096 Tappet Wrench. 03/20/2011: Added a Williams 1232A Thin Single-Open Wrench. 03/07/2011: Added a Williams 8729 Special Offset Box Wrench. 03/01/2011: Added a Williams 595 "Skinner Chuck" Toolpost Wrench. 02/27/2011: Added a Williams 8731A Offset Box Wrench. 02/25/2011: Added a Williams 8032A "Duohex-Box" Offset Box Wrench. 02/24/2011: Added a Williams 4731B Box-End Wrench. 02/19/2011: Added a Williams Early 1162 Combination Wrench and a Williams 1324 Open Flare-Nut Wrench. 02/07/2011: Added a Williams 662D S-Shaped Wrench. 02/05/2011: Added a Williams No. 5 Single-Open Engineer's Wrench. 02/04/2011: Added a Williams Early 29 Open-End Wrench. 01/30/2011: Added a Williams 1163 Combination Wrench. 01/28/2011: Added a Williams A1721 Ribbed-Style Open-End Wrench. 01/25/2011: Added a Williams Early 1092-B Tappet Wrench. 01/21/2011: Added a Williams 1733 Open-End Wrench. 01/12/2011: Added a Williams 6 Inch Adjustable Wrench. 01/01/2011: Added a Williams 1026 Open-End Wrench. 12/24/2010: Added a Williams 763A Textile Wrench. 12/04/2010: Added a Williams No. 2 Single-Open Wrench. 12/03/2010: Added a Williams 1803A Single-Box Wrench. 11/10/2010: Added a Williams [763A] 25/32x7/8 Textile Wrench. 11/09/2010: Added a Williams No. 34 Open-End Wrench. 11/01/2010: Added a Williams 6725 Short Box Wrench. 10/31/2010: Added a Williams 2723 Obstruction Wrench. 10/23/2010: Added a Williams 287T 5/16-Hex Drive Sliding Tee Handle and a Williams 287S 5/16-Hex Drive Rotating-Grip Extension. 10/21/2010: Added a Williams No. 287A Midget Electrical Set. 10/07/2010: Added a Williams 1472 Superrench Adjustable Spanner. 09/29/2010: Added a Williams 4038B Box-End Wrench. 09/28/2010: Added a Williams 4739 Box-End Wrench. 09/12/2010: Added a Williams B-30 3/8-Drive Offset Handle. 09/06/2010: Added a Williams 1731A Open-End Wrench. 09/05/2010: Added a Williams 1166 3/4 Combination Wrench. 08/27/2010: Added a Williams 1163 9/16 Combination Wrench. 08/22/2010: Added a Williams 1807 Single-Box Wrench. 08/10/2010: Added a Williams 1723 Open-End Wrench. 08/03/2010: Added a Williams Early 90 Tappet Wrench. 07/31/2010: Added a Williams 625 Check-Nut Wrench. 07/30/2010: Added a Williams Early 94 Tappet Wrench. 07/26/2010: Added a Williams 1731A Open-End Wrench. 07/22/2010: Added a Williams Early 25 Open-End Wrench. 07/21/2010: Added a Williams A1027B Ribbed-Style Open-End Wrench. 07/20/2010: Added a Williams 8132 Single-Offset Box Wrench and a Williams "A" 1/2x19/32 Open-End Wrench. 07/13/2010: Added a Williams 1134 "Ratcho" Open-End Wrench. 07/12/2010: Added a Williams AP-12 Adjustable Wrench. 07/08/2010: Added a Williams 1033-A Open-End Wrench. 07/07/2010: Added a Williams Early 8140 Single-Offset Box Wrench. 07/04/2010: Added a Williams Early 1034 Open-End Wrench. 06/29/2010: Added a Williams 1096 Tappet Wrench. 06/24/2010: Added a Williams S-43 1/2-Drive Flex Handle. 06/14/2010: Added a Williams 4721 Box-End Wrench. 06/07/2010: Added a Williams NM-51 1/4-Drive Ratchet. 05/25/2010: Added a Williams A1037 Ribbed-Style Open-End Wrench. 05/15/2010: Added a Williams 1165 Combination Wrench. 05/05/2010: Added a Williams SV-244 Specialty Box Wrench. 05/02/2010: Added a Williams 4723 Box Wrench. 04/29/2010: Added a Williams 92 Tappet Wrench. 04/24/2010: Added a Williams 92 Tappet Wrench. 04/22/2010: Added a Williams C90 Tappet Wrench. 04/21/2010: Added a Williams Early 96 Tappet Wrench. 04/17/2010: Added a Williams 1090 Tappet Wrench. 04/13/2010: Added a Williams C92 Tappet Wrench. 09/15/2009: Added a Williams S-102P 2 Inch Extension. 09/02/2009: Added a Williams 1029 Ribbed-Style Open-End Wrench. 08/28/2009: Added a Williams 628 Check-Nut Wrench. 08/27/2009: Added a Williams 8 Inch "Superjustable" Wrench. 08/14/2009: Added a Williams 726 Open-End Wrench. 08/13/2009: Added a Williams 2025 Obstruction Wrench. 08/09/2009: Added Williams PL-16 Thin-Nose Combination Pliers. 08/02/2009: Added a Williams S-231 Double Socket Wrench. 07/25/2009: Added a Williams 1164 Combination Wrench. 07/22/2009: Added a Williams X-1248 1 Inch Hex Drive Socket. 07/21/2009: Added a Williams A1039C Open-End Wrench and a Williams 1165 Combination Wrench. 07/11/2009: Added a Williams 8725 Offset Box Wrench. 07/10/2009: Added a Williams 634 Check-Nut Wrench. 07/05/2009: Added a Williams 41 "Mack" Open-End Wrench. 07/04/2009: Added a Williams B-50A 1/4-Drive Refrigeration Ratchet. 07/03/2009: Added a Williams 1166 Combination Wrench. 07/02/2009: Added a Williams 1725 Ribbed-Style Open-End Wrench. 06/25/2009: Added a Williams 7731A Box Wrench. 06/24/2009: Added a Williams 1318 Combination Open-Flare Wrench. 06/11/2009: Added a Williams 1990 "Special" (A183907) Brake Wrench. 06/09/2009: Added a Williams 1033C Open-End Wrench. 06/07/2009: Added a Williams 1735 Open-End Wrench. 06/06/2009: Added a Williams Early 1029 Open-End Wrench. 06/04/2009: Added a Williams 1034 Open-End Wrench and a Williams 1731A Open-End Wrench. 06/03/2009: Added a Williams 2725 Obstruction Wrench. 05/12/2009: Added a Williams 662B S-Shaped Wrench. 04/24/2009: Added a Williams 1984X Double-Square Brake Wrench. 04/22/2009: Added a Williams 7725B Box Wrench. 04/07/2009: Added Williams 1516 "Steeldraulic" Brake Pliers. 04/02/2009: Added a Williams 4 Inch "Superjustable" Wrench. 03/26/2009: Added a Williams 8735A Offset Box Wrench. 03/24/2009: Added a Williams 8037 Offset Box Wrench. 03/22/2009: Added a Williams 7033C Box Wrench. 03/21/2009: Added a Williams 634 Check-Nut Wrench and a Williams 1168 Combination Wrench. 03/18/2009: Added a Williams 662D S-Shaped Wrench. 03/07/2009: Added a Williams 8 Inch Adjustable Wrench. 03/06/2009: Minor reorganization of box wrenches, added a Williams B-55 3/8-Drive Ratchet Adapter. 02/27/2009: Added a Williams 8029B Offset Box Wrench. 02/26/2009: Added a Williams SP-420 Square Plug Socket, updated discussion of adjustable wrenches. 02/25/2009: Added a Williams 1731 Open-End Wrench and a Williams SP-20B Handle Bar. 02/24/2009: Added a Williams No. 100 Drain Plug Socket Set and a Williams SP-20E 1/2-Drive Sliding Tee Head. 02/22/2009: Added a Williams 727 Open-End Wrench and a box for the Williams 10 Inch "Superjustable" Wrench. 02/19/2009: Added a Williams 10 Inch "Superjustable" Wrench. 02/16/2009: Added a Williams 7727 Box Wrench. 02/15/2009: Added a Williams 1723 Open-End Wrench. 02/14/2009: Added a Williams 993 Early Spark Plug Wrench. 02/12/2009: Added a Williams 1127C "Ratcho" Wrench. 02/10/2009: Added a Williams 79S "Mack" S-Shaped Wrench. 02/06/2009: Added a Williams 8029 Offset Box Wrench. 01/24/2009: Added a Williams 1725B Ribbed-Style Open-End Wrench. 01/23/2009: Added a Williams 1033C Open-end Wrench. 01/22/2009: Added a Williams A1725B Ribbed-Style Open-end Wrench. 01/13/2009: Added a Williams 1171 Combination Wrench. 01/08/2009: Added a Williams 1041 Ribbed-Style Open-End Wrench. 01/06/2009: Added a Williams Early No. 33 Open-End Wrench and a Williams B-115 3/8-Drive Extension. 01/05/2009: Added a Williams Early No. 27 Open-End Wrench. 01/02/2009: Added a Williams 1733 Open-End Wrench. 12/25/2008: Added a Williams AP-10 Adjustable Wrench. 12/18/2008: Added a Williams F-50 3/8-Drive Ratchet. 12/17/2008: Added a Williams 2023 Obstruction Wrench. 12/13/2008: Added a Williams 1128 Ignition Wrench. 12/09/2008: Added a Williams 1132 Ignition Wrench and a Williams 1959 Starter & Manifold Wrench. 12/06/2008: Added a Williams 8031 Offset Box Wrench. 12/04/2008: Added a Williams 1034A Open-End Wrench. 11/23/2008: Added a Williams 1028 Open-End Wrench. 11/16/2008: Added a Williams 1029 Open-End Wrench. 10/27/2008: Added a Williams 6 Inch "Superjustable" Wrench. 10/22/2008: Added a Williams 1725B Open-End Wrench. 10/19/2008: Added a Williams 2033A Obstruction Wrench. 10/06/2008: Added a Williams M-110 1/4-Drive Convertible Handle. 10/01/2008: Added a Williams 1985 Brake Wrench. 09/15/2008: Added a Williams No. 6 Open-End Wrench. 09/13/2008: Added a Williams 4 Inch Adjustable Wrench. 09/11/2008: Added a Williams 7723 Box Wrench. 09/09/2008: Added a Williams 1983 Brake Wrench. 09/08/2008: Added a Williams 1092F Tappet Wrench. 09/07/2008: Added a Williams 2029 Obstruction Wrench. 09/05/2008: Added a Williams 1033C Open-End Wrench. 09/04/2008: Added a Williams 1033 Open-End Wrench. 09/02/2008: Added a Williams 1031 Open-End Wrench. 09/01/2008: Added a Williams 1029 Open-End Wrench. 08/29/2008: Added a Williams 1163 Combination Wrench. 08/28/2008: Added a Williams 8960 Double-ended Water-Pump Wrench. 08/27/2008: Added a Williams 1731-A Open-End Wrench. 08/25/2008: Added a Williams 1106 Ignition Wrench. 08/23/2008: Added a Williams 1981 Socket Wrench. 08/21/2008: Added a Williams 993 Spark Plug Wrench. 08/18/2008: Added a Williams SU-1222 1/2-Drive Universal Socket. 08/14/2008: Added a Williams 1113 Ignition Wrench. 08/13/2008: Added a Williams M-52 Ratchet. 08/11/2008: Added a Williams 1092-F Tappet Wrench and a Williams 1161 Combination Wrench. 08/10/2008: Added a Williams XOEE-1220 Short Combination Wrench. 08/09/2008: Added a Williams Early S-40 1/2-Drive Breaker Bar. 08/08/2008: Added a Williams 8034A Offset Box Wrench. 08/07/2008: Added a Williams 8037A Offset Box Wrench. 08/05/2008: Added a Williams 1027 Open-End Wrench. 08/04/2008: Added a Williams XOEE-1218 Short Combination Wrench and a Williams A731A Open-End Wrench. 08/03/2008: Added a Williams 1725B Open-End Wrench and a Williams 4725B Box Wrench. 08/02/2008: Added a Williams 3033A Open-End Wrench. 07/31/2008: Added a Williams 1023 Open-End Wrench and a Williams 1029 Open-End Wrench. 07/30/2008: Added a Williams 1166A Combination Wrench. 07/29/2008: Added a Williams 3731 Open-End Wrench. 07/28/2008: Added a Williams 1025 Open-End Wrench. 07/25/2008: Added a Williams 725 Open-End Wrench. 07/24/2008: Split into six pages, added a Williams 1720 Open-End Wrench and a Williams 1312 Combination Open-Flare Wrench. 07/23/2008: Added a Williams 1159 Combination Wrench. 07/22/2008: Added a Williams 1092-F Tappet Wrench, a Williams 8140 Single-Offset Box Wrench, and a Williams S-20C 1/2-Drive Offset Sliding Tee Handle. 07/21/2008: Added a Williams 1029 Open-End Wrench and a Williams A1033C Open-End Wrench. 07/19/2008: Added a Williams 1027B Open-End Wrench. 07/18/2008: Updated discussion of alloy specifications. 07/17/2008: Added a Williams 1316 Open-Flare Wrench. 07/16/2008: Added a Williams 1023 Open-End Wrench and a Williams 1027 Open-End Wrench. 07/15/2008: Added a Williams S-1225 1/2-Drive Socket. 07/14/2008: Added a Williams 1125 Special "Ratcho" Wrench. 07/12/2008: Added a Williams B-40 3/8-Drive Flex Handle. 07/10/2008: Added a Williams 1107 Ignition Wrench. 07/07/2008: Added a Williams [No. 726] Open-End Wrench and a Williams 1115 Ignition Wrench. 07/06/2008: Added a Williams 1124 Ignition Wrench and a Williams 5/8x25/32 Open-End Wrench. 07/04/2008: Added a Williams 1108A Ignition Wrench. 07/03/2008: Added a Williams 1114 Ignition Wrench. 06/28/2008: Added a Williams 8039 Offset Box Wrench and a Williams H-51 3/4-Drive Ratchet. 06/27/2008: Added a Williams 2728 Obstruction Wrench. 06/25/2008: Added a Williams S-10P 1/2-Drive Brace. 06/24/2008: Added a Williams Early 731B Open-End Wrench. 06/22/2008: Added a Williams 725 Open-End Wrench, a Williams 664A S-Shaped Wrench, a Williams 2021 Obstruction Wrench, and a Williams 2028 Obstruction Wrench. 06/21/2008: Added a Williams 2729 Obstruction Wrench and a Williams 2028S Obstruction Wrench. 06/20/2008: Added a Williams 2032 Obstruction Wrench and a Williams 6727 Short Box Wrench. 06/18/2008: Added a Williams 3/4x7/8 Open-End Wrench. 06/15/2008: Added a Williams 762 Special Textile Wrench and a Williams 1120 Ignition Wrench. 06/11/2008: Added a Williams 683A S-Shaped Wrench. 06/09/2008: Added a Williams Early 29 Open-End Wrench. 05/27/2008: Added a Williams 1025 Open-End Wrench. 05/21/2008: Added a Williams S-40A 1/2-Drive Breaker Bar and a Williams M-110 9/32-Drive Handle Extension. 05/18/2008: Added a Williams 9/16x11/16 Open-End Wrench. 05/09/2008: Added a Williams F-50 3/8-Drive Ratchet. 05/03/2008: Added a Williams B-108 3/8-Drive Extension. 05/01/2008: Added a Williams 1515 Snap-Ring Pliers. 04/18/2008: Added a Williams 9727 "Duohex-Box" Offset Box Wrench. 04/17/2008: Added a Williams C-98 Wood Chisel. 04/14/2008: Added a Williams "Ratcho" Ratcheting Open-End Wrench. 04/11/2008: Added a Williams 723A "Pierce-Arrow" Open-End Wrench. 04/10/2008: Added a Williams 737 Open-End Wrench. 04/04/2008: Added a Williams 704 Single-Open Wrench. 04/03/2008: Added a Williams S-1236 1/2-Drive Socket. 04/01/2008: Added a Williams 1122 Ignition Wrench. 03/27/2008: Added a Williams 1090 Tappet Wrench. 03/22/2008: Added a Williams 8725B Offset Box Wrench and a Williams BA-5 3/8-Drive Hex Driver. 03/21/2008: Added a Williams S-110P 1/2-Drive Extension. 03/14/2008: Added a Williams 1727 Open-End Wrench. 03/09/2008: Added a Williams 761 Special Textile Wrench. 03/07/2008: Added a Williams B-42 3/8-Drive Flex-Head Breaker Bar. 03/03/2008: Added a Williams 1161 7/16 Combination Wrench. 02/27/2008: Added a Williams NX-20B/C 1 Inch Drive Sliding Tee Bar. 02/26/2008: Added a Williams S-15A 1/2-Drive Speeder and a Williams NX-51 1 Inch Drive Ratchet. 02/25/2008: Added a Williams 1031 Ribbed-Style Open-End Wrench. 02/23/2008: Added a Williams A1031B Ribbed-Style Open-End Wrench. 02/22/2008: Added a Williams 1034A Ribbed-Style Open-End Wrench. 02/05/2008: Added Williams MP-1 and MP-2 1/4-Drive Screwdrivers and a Williams NM-2 1/4-Drive Socket Set. 02/04/2008: Added a Williams NM-7 1/4-Drive Socket Set. 02/03/2008: Added a Williams 1116 Ignition Wrench. 02/02/2008: Added a Williams 1114 Ignition Wrench. 01/30/2008: Added a Williams 1291P Midget Electrical Set. 01/29/2008: Added a Williams B-20A 3/8-Drive Breaker Bar. 01/27/2008: Added a Williams 1/2-Hex Drive S-50 Ratchet. 01/22/2008: Added a Williams 1132 Ignition Wrench and a Williams A27C Open-End Wrench. 01/17/2008: Added a Williams S-41 1/2-Drive Breaker Bar and a Williams M-115 1/4-Drive Extension. 01/16/2008: Added a Williams 807 Single-Box Wrench. 01/14/2008: Added a Williams 1090a Tappet Wrench. 01/12/2008: Minor reorganization, split into five pages. 01/10/2008: Added a Williams 8727 Offset Box-End Wrench. 01/09/2008: Added a Williams H-1260 3/4-Drive Socket. 01/01/2008: Added a Williams B-52 3/8-Drive Ratchet. 12/31/2007: Added a Williams 1998B Brake Spoon. 12/30/2007: Added a Williams WSM-1A 1/4-Drive Socket Set and a Williams 1328 Open Flare-Nut Wrench. 12/19/2007: Added a Williams M-106 1/4-Drive Handle. 12/17/2007: Added a Williams 7733 Box-End Wrench and a Williams H-41A 3/4-Drive Breaker Bar. 12/16/2007: Added a Williams S-15P 1/2-Drive Speeder and a Williams S-5 1/2-Drive Socket Set. 12/15/2007: Added a Williams 1033C Open-End Wrench. 12/13/2007: Added a Williams 4040B Box-End Wrench. 12/12/2007: Added a Williams 1176 Combination Wrench. 12/11/2007: Added a Williams S-15 1/2-Drive Speeder. 12/09/2007: Added a Williams "A" Open-End Wrench. 12/08/2007: Added a Williams No. 30 Open-End Wrench. 12/07/2007: Added Williams ST-12xx Double-Groove Sockets. 12/06/2007: Added Williams ST-12xx Transitional Sockets and a Williams SC-8 1/2-Drive Adjustable Crowfoot. 12/05/2007: Added a Williams 529 Toolpost Wrench and a Williams S-1 1/2-Drive Socket Set. 12/04/2007: Added a Williams 1997 Offset Screwdriver. 11/24/2007: Added a Williams 729 "White" Open-End Wrench and a Williams 483 Adjustable Face Spanner. 11/17/2007: Added a Williams S-60C 1/2-Drive Stud Extractor. 11/15/2007: Added a Williams H-1244 3/4-Drive Socket. 11/12/2007: Added a Williams 1021S Brake Wrench. 11/10/2007: Added a Williams "A" Open-End Wrench. 11/07/2007: Added a Craftsman 44604 Adjustable Wrench. 11/06/2007: Added a Williams NX-1240 1 Inch Drive Socket. 11/05/2007: Added a Williams NX-1264 1 Inch Drive Socket. 11/04/2007: Added a Williams No. 81 1 Inch Drive Socket Set and a Williams 18021 Offset Box Wrench. 11/03/2007: Added a Williams 635E Check-Nut Wrench and a Williams 1723 Open-End Wrench. 11/02/2007: Added a Williams NX-20B Breaker Bar. 11/01/2007: Added a Williams 4739 Box-End Wrench. 10/18/2007: Added a Craftsman 8 Inch Adjustable Wrench. 10/13/2007: Added a Williams 1152 Box-End Ignition Wrench and a Williams S-51 1/2-Drive Ratchet. 10/07/2007: Added a Williams 969A Socket Wrench and a Williams "A" Open-End Wrench. 10/06/2007: Added a Williams 1027 Open-End Wrench. 10/05/2007: Minor reorganization of sections, added a Williams 7721 Box Wrench. 10/04/2007: Added a Williams No. 1999 Multi-Socket Wrench. 09/25/2007: Added a Williams 864F "S" Wrench and a Williams 1090D Tappet Wrench. 09/22/2007: Added a Williams 529 Toolpost Wrench. 09/21/2007: Added a Williams Early 731 Open-End Wrench. 09/07/2007: Added a Williams 9725B Offset Box Wrench. 09/02/2007: Added a Williams 663E S-Shaped Wrench. 08/25/2007: Added a Williams No. 2 Bull Dog Wrench. 08/20/2007: Added a Williams Early 762C Textile Wrench. 08/18/2007: Added a Williams 1732 Open-End Wrench. 08/12/2007: Added a Williams 8946 Water Pump Wrench. 08/11/2007: Added a Williams 1096H Tappet Wrench. 08/10/2007: Added a Williams 7025 Box-End Wrench. 08/04/2007: Added a Williams 8962D Water Pump Wrench. 07/26/2007: Added a Williams 1096H Special Tappet Wrench. 07/25/2007: Added a Williams 8946 Water Pump Wrench. 07/17/2007: Added a Williams 8727A Offset Box Wrench. 07/10/2007: Added a Williams 1132 Ignition Wrench. 07/09/2007: Added a Williams 1721 Open-End Wrench. 07/01/2007: Added a Williams A1723A Open-End Wrench. 06/29/2007: Added a Williams NX-115 1 Inch Drive Extension. 06/21/2007: Added a Williams 8045 Offset Box-End Wrench and Williams ST-12xx 1/2-Drive Sockets. 06/18/2007: Added Williams H-12xx 3/4-Drive Sockets. 06/17/2007: Added a Williams 8033C Offset Box Wrench. 06/16/2007: Added a Williams X-41 1 Inch Drive Breaker Bar. 06/15/2007: Added a Williams 8962 Water Pump Wrench and a Williams H-20A 3/4-Drive Breaker Bar. 06/14/2007: Added a Williams No. 35 Open-End Wrench. 06/08/2007: Added a Williams Early 761C Textile Wrench. 06/07/2007: Added a Williams H-1808 Single Box Box Wrench. 06/06/2007: Added a Williams 8733 Offset Box Wrench and a Williams 8808 Slugging Wrench. 06/05/2007: Added a Williams H-115 3/4-Drive Extension. 06/04/2007: Added a Williams 8940 Waterpump Wrench and a Williams 1334 Combination-Flare Wrench. 06/02/2007: Added a Williams 8948 Waterpump Wrench. 05/30/2007: Added a Williams No. 3 Open-End Wrench. 05/28/2007: Added a Williams H-150 3/4-Drive Ratchet Plug and a Williams H-140 3/4-Drive Universal. 05/26/2007: Added a Volume VB-15 3/8-Drive Speeder. 05/25/2007: Added a Williams H-50 3/4-Drive Ratchet. 05/24/2007: Added a Williams-Husky No. 287 Wrench Set Illustration. 05/22/2007: Added a Williams H-41 3/4-Drive Breaker Bar. 05/11/2007: Added a Williams H-1270 3/4-Drive Socket. 05/10/2007: Added a Williams 2033A Obstruction Wrench. 05/08/2007: Added a Williams B-15 3/8-Drive Speeder and a Williams Early H-110 3/4-Drive Extension. 05/06/2007: Added a Williams S-10 1/2-Drive Brace. 05/04/2007: Added a Williams X-51 1 Inch Drive Ratchet. 05/01/2007: Added a Vulcan No. 30 Bijaw Chain Pipe Wrench. 04/22/2007: Added Volume VB-12xx 3/8-Drive Sockets. 04/20/2007: Added a Williams 4731A Box-End Wrench. 04/15/2007: Added a Williams 2027 Obstruction Wrench and a Volume VB-51 3/8-Drive Ratchet. 04/13/2007: Added a Williams M-310 9/32-Drive Socket Set and a Williams M-42 9/32-Drive Breaker Bar. 04/10/2007: Split into four pages, added a Williams NX-110 1 Inch Drive Extension. 04/02/2007: Added a Williams 1023 Open-End Wrench and a Williams 1729 Open-End Wrench. 03/10/2007: Added a Williams 556 Toolpost Wrench. 03/09/2007: Added a Williams 1998A Brake Spoon. 03/04/2007: Added a Williams Early 10 Inch Superjustable Wrench. 03/03/2007: Added a Williams Early 1090 Tappet Wrench. 03/01/2007: Added a Williams 8 Inch Adjustable Wrench. 02/23/2007: Added Williams No. 76 Needlenose Pliers. 02/18/2007: Added a Williams 1735 Open-End Wrench and a Williams 1037 Open-End Wrench. 02/17/2007: Added a Williams No. 0 Chain Wrench and a Williams 4731B Box-End Wrench. 02/14/2007: Added a Williams M-51 1/4-Drive Ratchet. 02/08/2007: Added a Williams 1170 Combination Wrench, a Williams 472 Adjustable Spanner, and a Volume VS-1220 1/2-Drive Socket. 01/29/2007: Added Williams 1520 Waterpump Pliers. 01/28/2007: Added a Williams Vulcan Auto Tool and a Williams S-52 1/2-Drive Ratchet. 01/26/2007: Added an early Williams Early No. 1999 Multisocket Wrench. 01/25/2007: Added a Craftsman 8-In-1 Socket Wrench. 01/23/2007: Added a Williams S-20A T-Slider Breaker Bar. 01/22/2007: Added a Williams 1999 Multisocket Wrench. 01/21/2007: Added a Williams 1034(?) Tappet Wrench. 01/11/2007: Added a Williams 18731A Box-End Wrench. 01/05/2007: Added a Williams 1726 Open-End Wrench. 12/31/2006: Added a Williams 662F S-Shaped Wrench and a Williams 1727 Open-End Wrench. 12/21/2006: Added a Williams 3721 Open-End Wrench and a Williams 1158 Combination Wrench. 12/20/2006: Added a Williams 1077-S S-Shaped Wrench and a Williams 1160 Combination Wrench. 12/19/2006: Split into three pages, added a Williams 9723 Short Offset Box Wrench and a Williams APL-6 Locking Adjustable Wrench. 12/14/2006: Added a No. 19725 Box-End Wrench and a Williams B-52 Ratchet. 12/12/2006: Added a Williams 624 Check-Nut Wrench. 12/11/2006: Added a Williams 2027C Obstruction Wrench. 12/10/2006: Added a Williams 255A Socket Wrench. 12/09/2006: Added a Williams 1161 Combination Wrench. 12/06/2006: Added a Williams S-51 1/2-Drive Ratchet and a Williams BS-71 1/2-Drive Ratchet. 12/03/2006: Added a Williams AP-4 Adjustable Wrench and a Williams B-51 Ratchet. 12/02/2006: Added a Williams AP-8 Adjustable Wrench. 12/01/2006: Added a Williams 1032B Open-End Wrench. 11/29/2006: Added a Williams AB-8 Adjustable Wrench and a Williams MR-51 Refrigeration Ratchet. 11/26/2006: Added a Williams S-30 Breaker Bar. 11/21/2006: Added the clever Williams NM-110 Convertible Drive Handle. 11/19/2006: Added a Williams 1128 Ignition Wrench. 11/12/2006: Added a Williams 8936 Waterpump Wrench. 11/06/2006: Added patent table and wrench face markings. 10/30/2006: Added a 7029 Duohex-Box Wrench. 10/29/2006: Added a 7731B Box-End Wrench. 10/28/2006: Added a A723 Open-End Wrench. 10/23/2006: Added a 8966 Double-Ended Water Pump Superrench. 10/19/2006: Added a 1167A Combination Wrench. 09/30/2006: Added a 1085 S-Shaped Wrench. 09/28/2006: Added a 3033A Open-End Wrench. 09/25/2006: Added a Early 632 Check-Nut Wrench and a 7039B Box-End Wrench. 09/22/2006: Added S-12xx 12-Point Sockets. 09/21/2006: Added an 8731A Offset Box Wrench and an 8029 Offset Box Wrench. 09/20/2006: Added an 8029B Offset Box Wrench and an 1164 Combination Wrench. 09/19/2006: Split article into two pages, added an 8037 Duohex-Box Offset Wrench. 09/18/2006: Added a 2021 Obstruction Wrench. 09/17/2006: Added a 2731A Obstruction Wrench. 09/16/2006: Added a 1167 Combination Wrench. 09/15/2006: Added a 1096 Flat-Shank Tappet Wrench. 09/14/2006: Added an 8729 Panelled Offset Box Wrench and a 7727A Box Wrench. 09/10/2006: Added an 8729 Duohex-Box Offset Box Wrench. 09/09/2006: Added an 8128 Single-Offset Box Wrench and an 8140 Single-Offset Box Wrench. 09/03/2006: Added a group of early S-4xx Square Sockets and a S-40 1/2-Drive Breaker Bar. 09/01/2006: Added a 525 Toolpost Wrench. 08/31/2006: Added a 1729 Ribbed Open-End Wrench and a 9723 Offset Box-End Wrench. 08/30/2006: Added a Williams 1029 Open-End Wrench and a 7725B Raised-Panel Box-End Wrench. 08/29/2006: Added a A90 Tappet Wrench, a 633 Mack Check-Nut Wrench, and a B-40 3/8-Drive Breaker Bar. 08/26/2006: Added a 2028S Obstruction Wrench. 08/25/2006: New table of catalogs, added a S-1240 1/2-Drive Socket. 08/24/2006: Added a S-50 1/2-Drive Ratchet. 08/23/2006: Added a S110 1/2-Drive Rotating-Grip Extension. 08/22/2006: Added a No. 21R 1/2-Drive Socket Set. 08/18/2006: Added a S115 Rotating-Grip Extension. 08/17/2006: Added a 1731 Superrench Open-End Wrench. 08/11/2006: Added a S-1234 12-Point Socket and a S-824 8-Point Socket. 08/01/2006: Added a 8729A Duohex-Box Offset Wrench. 07/31/2006: Added a 7729 Box-End Wrench. 07/21/2006: Added a 6723 Box-End Wrench and a 7727A Box-End Wrench. 07/20/2006: Added a 1164 Combination Wrench. 07/19/2006: Added a 1727 Ribbed-Style Open-End Wrench. 07/14/2006: Added a 31 Open-End Wrench. 07/12/2006: Added a 8938 Water Pump Superrench and a S-50 Ratchet. 06/17/2006: Created page, no content yet. Williams registered a number of trademarks, including the W-Diamond logo, "Williams", "Agrippa", "Vulcan", "Superrench", and "Superratchet". Information on some of the more important trademarks is summarized in the table below. 01/01/1884 04/05/1912 04/27/1915 104,112 W-Diamond logo. Williams [Underline Logo] 11/09/1924 07/27/1925 07/19/1927 230,447 Company address in Buffalo. Williams tools are generally not marked with a date code or other explicit indication of the manufacturing date. When an estimate of the manufacturing date is needed, it will have to be based on other information such as company name markings, tool design style, patent markings, and other factors. W-Diamond Logo. 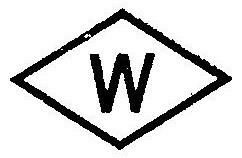 The Williams W-Diamond logo was registered as a trademark, with the first use listed as 1884. Buffalo Factory. Williams built a new factory in Buffalo (New York) in 1914. Since tools were then being made in two locations, it's likely that Williams introduced slightly different face markings to distinguish production at Brooklyn from production at Buffalo. Brooklyn Marking. The company moved its headquarters from Brooklyn to Buffalo some time after 1919. Williams Scroll Logo. The Williams name underlined by the "S" was registered as a trademark, with the first use listed as 1924. The initial use on wrench faces included a W-Diamond logo below the scroll, with "Forged in U.S.A." or similar text. Superrench Trademark. The "Superrench" trademark was registered in 1925. Fractional Sizes for Wrench Openings. 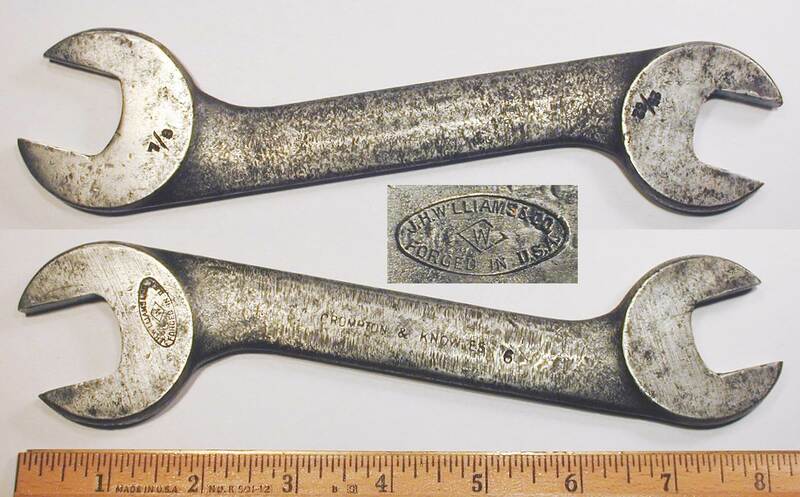 Until about 1927 Williams generally marked wrench openings with the nominal bolt size, using the older U.S.S., S.A.E., or other appropriate size convention. With the adoption of the American Standard system of sizing, wrench openings were marked with the fractional (across-flats) size. "Chrome Alloy" Marking. In the 1930s Williams began changing its alloy markings to a more generic "Chrome Alloy", even while continuing to use chrome molybdenum steel for most of its production. By around 1935 it's likely that most forged-in markings had been updated to "Chrome Alloy". We have an extensive discussion of this in the section below on Alloy Specifications and Markings. 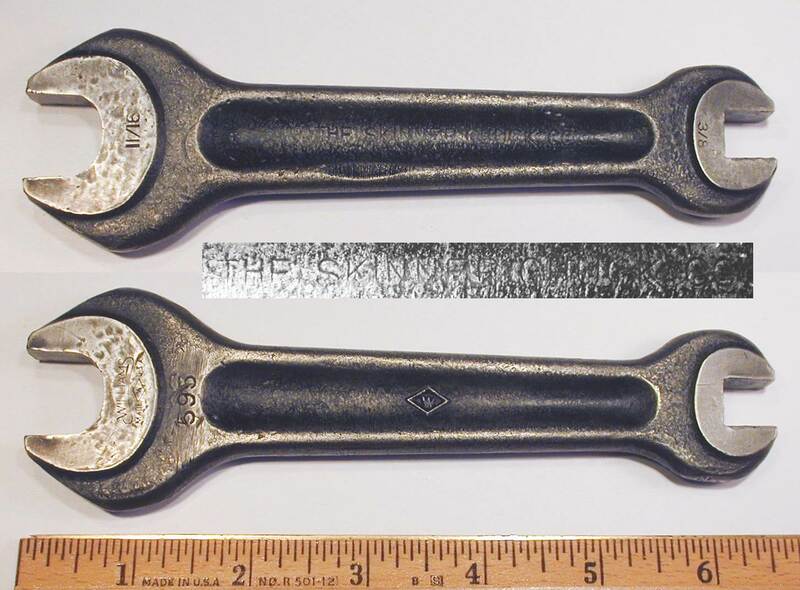 Transitional Duohex-Box Markings on Angled Box Wrenches. 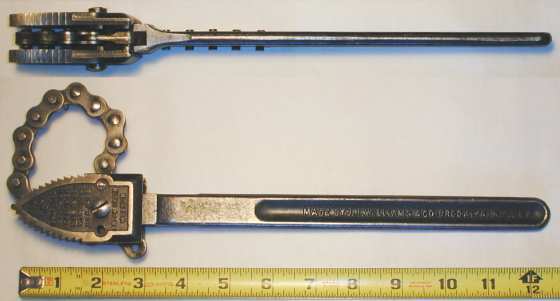 Angled box wrenches were introduced in 1937 and initially carried a transitional form of marking derived from the earlier Duohex-Box wrenches. By 1940 the standard marking for oval-shank box wrenches was likely in use. NX Series of 1 Inch Drive Tools. In the late 1930s Williams introduced 1 inch (square) drive tools in the NX series, a replacement for older hex drive tools. NM Series of 1/4-Drive Tools. In 1940 Williams introduced 1/4-drive tools in the NM- series as a replacement for 9/32 drive. 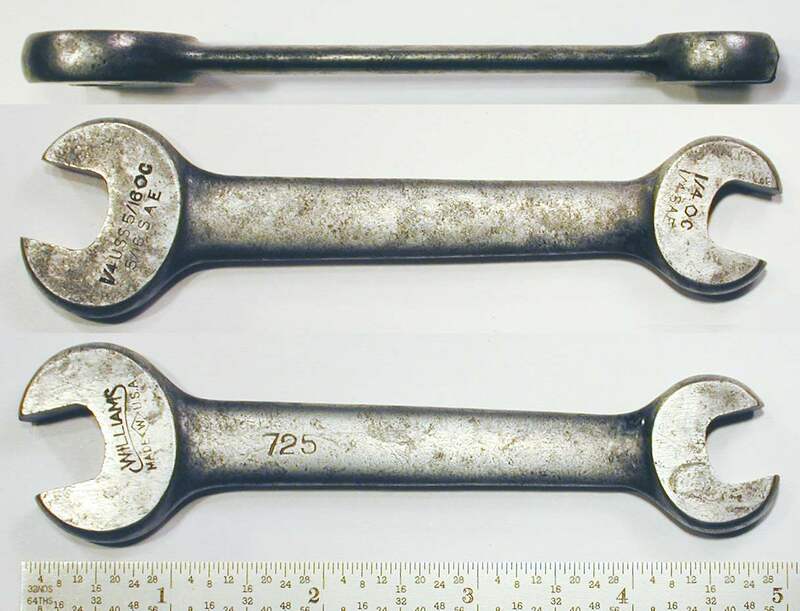 Oval-Shank Box Wrenches. 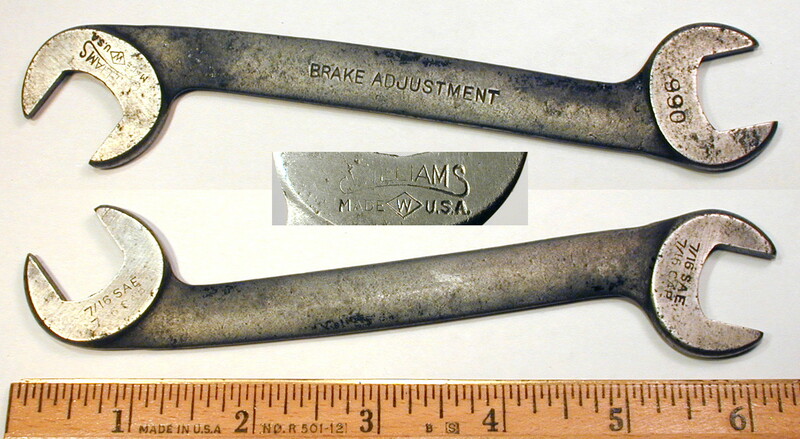 By 1940 Williams was producing box wrenches in the oval-shank style with the standard markings. Cadmium, Painted, or Plain Finish During Wartime Years. Due to material shortages during the 1941-1945 wartime years, the standard chrome plated finishes were replaced with cadmium plated, painted, or plain steel finishes. Rough Surface Finish on Wrench Faces During Wartime Years. Williams generally applied grinding and polishing operations to wrench faces prior to plating. During the 1941-1945 wartime years these final finishing steps were sometimes omitted, leaving the wrench faces with obvious lines from the last machining or grinding step. This type of rough machined surface can be easily distinguished from the random pitted surface caused by extensive rusting. An good example of the rough surface finish is provided by the Williams 1725B Open-End Wrench. Alloy Marking on "Superrench" Tools. In 1942 or soon thereafter Williams began using the "Alloy" marking for some tools, instead of the earlier "Chrome-Molybdenum" or "Chrome-Alloy" markings. This change was probably made due to material shortages during the wartime years, but shortly after the war Williams stopped mentioning specific alloys in its catalogs. We have a more extensive discussion of this in the section below on Alloy Specifications and Markings. "Williams U.S.A." Logo on Wrench Faces. Around 1947 the wrench face markings were updated to use the Williams scroll with "U.S.A." below, replacing the older W-Diamond logo. The W-Diamond logo continued to be marked on some tool shanks, and on smaller wrenches faces when the full Williams name wouldn't fit. Double-Groove Style for Sockets. The double-groove style for sockets (see for example the 1/2-Drive Double-Groove Sockets) was introduced around 1948. 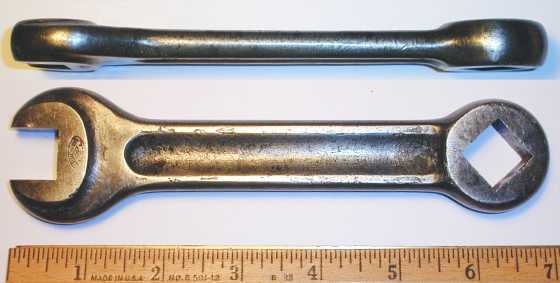 Ribbed-Style Open-End Wrenches. The "ribbed" style for open-end wrenches was introduced in 1952. This style remained in use until 1959, when it was replaced by the flat shank style. Raised Panels on Wrenches. The raised-panel wrench style was introduced in the mid 1950s, some time after the 1952 advent of the ribbed style. This style remained in use until 1959 for combination wrenches and until 1960 for box-end wrenches. Flat Shanks on Wrenches. The wrench style with flat shanks was introduced in 1959 for open-end and combination wrenches, and by 1960 for other wrench types. Cross-bar Holes with 1/2-Drive Deep Sockets. The SD-12xx series deep sockets were fitted with cross-bar holes until at least the mid 1950s, but by 1960 cross-bar holes had been discontinued. Cold-formed Sockets. By the mid 1970s Williams was using a cold-forming process (called "Impact Extruded" in the catalog) for making sockets in 3/8 through 1 inch drive sizes. Williams changed the style of the face markings on its wrenches several times over the years, and these markings therefore provide an approximate guide to the manufacturing date. Fig. 1. Williams Early "Brooklyn" Face Markings. Fig. 1 shows an example of one of the earliest face markings, consisting the text "J.H. 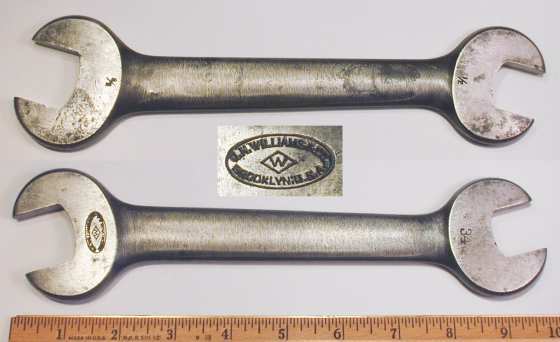 Williams & Co." and "Bklyn, N.Y. U.S.A.", typically stamped on the face of a wrench. Tools bearing this face marking generally also have a W-Diamond logo forged into the shank. This marking is believed to have been used on early production, when the Brooklyn address referred to both the company's headquarters and its principal factory location. This mark will be referred to in the text as the early Brooklyn face marking. Fig. 2. Williams Oval "Brooklyn" Face Markings. Fig. 2 shows the first of a pair of similar markings, consisting of an oval outline with the text "J.H. Williams & Co." and "Brooklyn, U.S.A.", with the W-Diamond logo in the center. On smaller tools, the text was generally abbreviated further to fit in the available space. The Brooklyn address suggests that this marking was used distinguish production in the Brooklyn factory, with the other oval logo (see next figure) indicating the Buffalo factory. Williams built its Buffalo factory in 1914, and the oval logos are believed to have been used from around 1914 until 1924. This mark will be referred to in the text as the JHW-Brooklyn logo. Fig. 3. Williams Oval "Forged" Face Markings. Fig. 3 shows the very similar oval outline with the text "J.H. Williams & Co." and "Forged in U.S.A.", again with the W-Diamond logo in the center. This marking was likely used to distinguish production at the Buffalo factory (or other facilities) from the main Brooklyn factory and headquarters (see previous figure). Williams built its Buffalo factory in 1914, and the oval logos are believed to have been used from around 1914 until 1924. This mark will be referred to in the text as the JHW-Forged logo. Fig. 4. Williams "Forged in U.S.A." Face Markings. Around 1924 Williams updated its wrench face markings to the style shown in Fig. 4 at the left. The Williams name is underlined by a scroll from the terminal "S", and the text "Forged in U.S.A." appears below, with the W-Diamond logo in the center. The 1924 date is based on the trademark registration for the Williams name with the scroll underline, which lists 1924 as the first use date. Several alternate forms of this style were used for smaller tools with insufficient space for the full "Forged in U.S.A." text. These alternates (in order of decreasing size) used the text "Made in U.S.A.", then "Made U.S.A.", and finally just "U.S.A." for the smallest tools. Examples of these markings can be found at various places in this article. Fig. 5. Williams "U.S.A." Face Markings. This style of marking was generally used on wrench faces from about 1947 until around 1955, after which the adoption of the ribbed wrench style forced the markings to move to the shank. This marking was also used on tools without a well-defined "face", being placed on the shank or some other part of a tool. We'll refer to this as the "Williams U.S.A." marking in the text. One slightly puzzling aspect of the Williams "Superrench" line is the variation in the markings for alloy content. The wrenches believed to be of the earliest production are invariably marked "Chrome-Molybdenum" (or equivalent), but tools of possibly later production are sometimes marked "Chrome-Alloy" or simply "Alloy". When we first noticed the variation in markings, we had hoped that this would provide a simple means of estimating the manufacturing date. After extensive analysis of the markings, we can show that in certain cases the alloy markings do provide some information on the production date. To begin researching this issue, we first did a quick review of the alloy composition noted in various Williams catalogs, and have summarized the observations in the table below. Note that the table reflects only what was printed in the catalogs, not necessarily what was marked on (or used for) the tools themselves. Several comments are worth noting here. Our first observation is that the stated alloy composition is consistent across all types of tools for a given catalog edition, with the exception of the early combination wrenches. This suggests that if changes in the alloy usage were going to be made for a particular year, the change was made across the board. Secondly, note that for 1947 (and later) no specific guidance is provided for the alloy composition; the catalogs simply note the use of "Selected Alloy Steels". This gave Williams the maximum flexibility to match their alloy steel usage with engineering requirements (or market conditions) as needed. Our last observation is that (obviously) chrome-molybdenum steel is a chrome alloy, and a wrench marked "Chrome Alloy" and made of chrome-moly steel has met its specification. We can extend this discussion by asking a trick question: is chrome-nickel-moly steel a chrome-molybdenum alloy? A "yes" answer might argue that since a chrome-nickel-moly alloy does contain chromium and molybdenum, it's also a chrome-molybdenum alloy. But chrome-molybdenum has a degree of specificity to it and identifies a class of alloys such as AISI 4140, whereas chrome-nickel-molybdenum identifies a different class of alloys, such as AISI 8640, 8740, and 8742. All of these alloys have highly desirable properties for toolmaking, but there may be engineering or economic reasons for choosing one over the others. If Williams generally intended to use chrome-moly steel, but wanted flexibility to substitute chrome-nickel-moly or even chrome-vanadium steel, a chrome-alloy marking would cover all cases. We actually tested some Williams wrenches for alloy content and found that an early wrench marked "Chrome-Molybdenum" had a composition similar to AISI 4140 chrome-moly steel, while two later wrenches marked "Alloy V" were similar to AISI 8640 chrome-nickel-moly steel. (See our article on Alloy Steels for discussion of the testing.) Thus it's possible that Williams may have had discussions of this sort internally and decided in favor of a more generic marking. After reviewing the catalog information, the next step should be to compare the actual markings on tools with the printed specifications. This would be easy if Williams tools were marked with date codes, but without date codes it's generally not possible to determine the manufacturing date with sufficient precision. However, it turns out that a small number of tools have markings or other features to provide a relatively precise estimate of the manufacturing date. The list below summarizes the special cases we've identified so far, and hopefully others will be found as well. Patent Pending Markings on Obstruction Wrenches. Obstruction wrenches were first offered in the mid 1920s, and some of these tools are stamped with a "Pat. Pendg" notation. The earliest catalogs also mention the patent pending status, but later catalogs (after the 1920s) no longer mention a patent. Hence it's reasonable to assume that the wrenches with the patent notice are from the mid 1920s, and all of the available examples are marked "Chrome-Molybdenum". The examples include the Williams 2021 Obstruction Wrench and Williams 2027C Obstruction Wrench. Patent Notice on Waterpump Wrenches. Waterpump wrenches were introduced in the early 1930s, and some examples are known to be marked with a patent notice for the Gillett 1929 patent #RE17,417. This patent is also noted in catalogs from 1931 and 1933, but not in catalogs from 1937 and later. It's reasonable to assume that the patent-marked waterpump wrenches are from the early 1930s, and all of these wrenches are marked "Chrome-Molybdenum". See for example the Williams 8962 Waterpump Wrench. Transitional "Duohex-Box" Marking on Oval-Shank Wrenches. 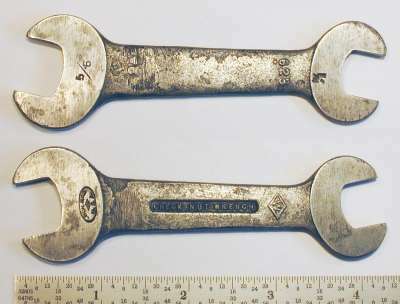 Angled box wrenches with the oval shank style were introduced around 1937, and some examples of these wrenches have been found with a "Duohex-Box" transitional marking. 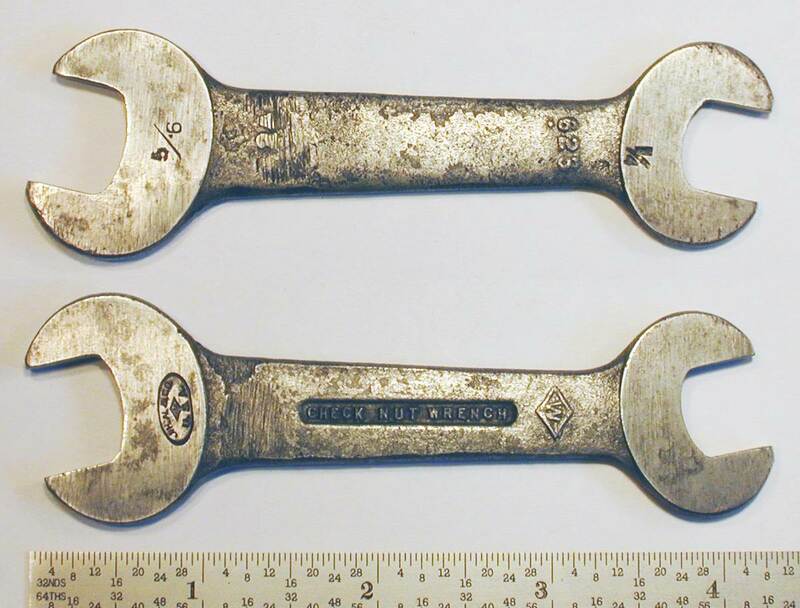 The modern box wrench marking was introduced around 1940, so that the examples with transitional markings were likely made from 1937-1939. An example of a transitional wrench can be seen as the Williams 7025 "Duohex-Box" Wrench. 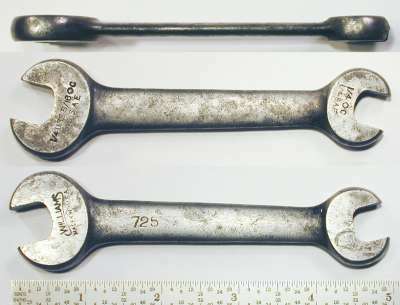 Of the transitional wrenches examined so far, four out of six are stamped "Chrome-Alloy", and the other two have no alloy markings. Significantly, none of them are marked "Chrome Molybdenum", although chrome moly steel was standard during the time these wrenches were made. Cadmium or Plain Finish on Oval-Shank Wrenches. The standard chrome-plated finish was generally replaced by cadmium, plain, or painted finishes during the wartime years of 1942-1945. Numerous examples of oval-shank wrenches with cadmium or similar finishes have been found, and almost all of these have been stamped "Alloy Steel". Examples include the Williams 7721 Box Wrench, Williams 4731A Box Wrench, and Williams 4731B Box Wrench. Review of Markings on Oval-Shank Wrenches. 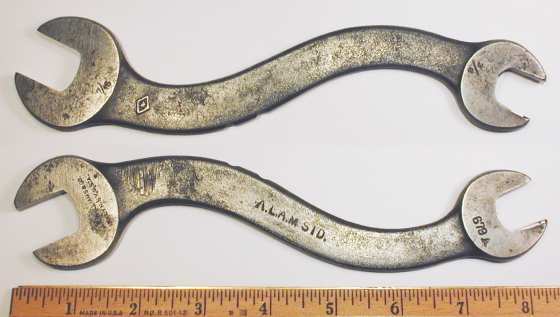 A review of the markings on all 29 examples of oval-shank box wrenches in our collection (at that time) found that all except for three were marked "Alloy Steel". The three exceptions were marked "Chrome-Alloy". Cadmium or Plain Finish on Open-End Wrenches. As noted above, during the 1942-1945 wartime years chrome finishes were generally replaced by cadmium, plain, or painted finishes. A number of examples of the open-end "Superrench" series have been found with cadmium or similar finishes, and the majority of these are marked with "Alloy" forged into the shank, but with some examples marked "Chrome-Alloy" being noted as well. Examples include the Williams 1725B Wrench (Painted), Williams 1725B Wrench (Plain), Williams 1027 Wrench, Williams 1029 Wrench (Painted), Williams 1029 Wrench (Plain), Williams 1029 Wrench, and Williams 1034A Wrench (Plain). Significantly, no examples of apparent wartime production have been found with "Chrome Molybdenum" markings. Since open-end wrenches of this era had forged-in markings, this implies that Williams had already converted its forging dies to "Chrome Alloy" prior to the wartime era. Late Production of Angle-Head Obstruction Wrenches. 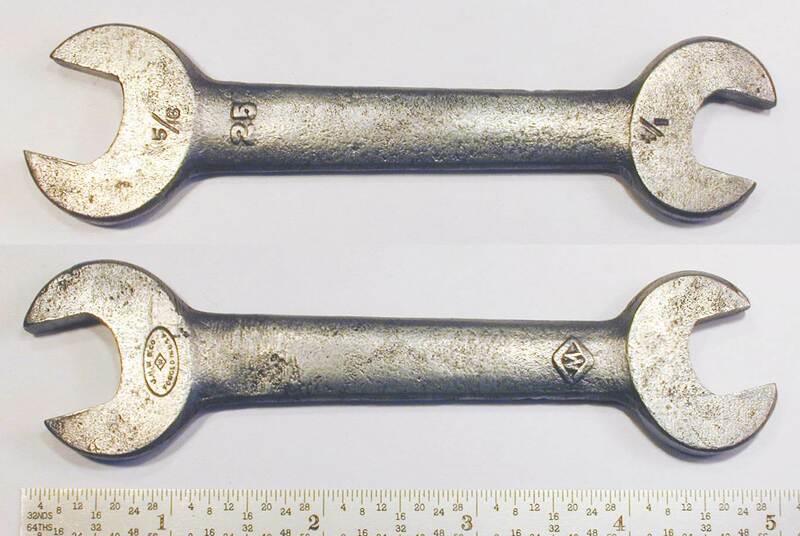 Production of angle-head obstruction wrenches was discontinued around 1945. We have one example of an obstruction wrench that appears to be of mid 1940s production, based on its gray-green powder-coat finish instead of the standard chrome plating. This wrench has a forged-in "Alloy" marking on the shank, and can be seen as the Williams 2033A Obstruction Wrench. In 1947 Williams updated the face markings on wrenches to use the "Williams U.S.A." logo instead of the older W-Diamond logo. Based on our catalog review, in 1947 and later we would expect to find only an "Alloy" marking. These two rules would imply that wrenches with the "Williams U.S.A." face logo should have an "Alloy" marking, and a quick check of the examples available here has found no exceptions to this rule. We'll now attempt to summarize the observations noted above into some guidelines for interpreting the alloy markings. First Use of "Alloy" Marking. Several of the numbered observations above (4, 5, 6, and 7) establish the extensive use of the "Alloy" marking during the 1942-1945 wartime years, and we have no documented uses of the "Alloy" marking before this time. Although Williams didn't change its catalogs to specify "Alloy" until 1947, once the tooling was set up for this marking, it would have been advantageous to continue its use, especially when the marking is incised in a forging die. Based on these arguments, we believe that the "Alloy" marking very likely indicates production from 1942-1943 or later. Thus the "Alloy" marking and other factors may serve to significantly narrow the potential production dates for a particular tool. The fact that Williams listed its specifications as "Chrome Alloy" in the 1931 and 1933 catalogs shows that the company realized it needed some flexibility in its alloy usage. Since many of its tools had the markings incised into the forging dies, it would have been difficult to update the markings quickly. Observation number (3) above shows that when alloy markings were added to the new angled box wrenches beginning in 1937, only "Chrome Alloy" was used. Observation number (5) above notes that for oval-shank wrenches made from 1940 onward, only "Chrome-Alloy" or "Alloy" markings were used. And finally, observation number (6) shows that substantially all of the forging dies for open-end wrenches had been updated to "Chrome Alloy" prior to the wartime years. These observations show that Williams had worked during the 1930s to change its alloy markings to "Chrome Alloy", and that it chose not to use the more specific "Chrome Molybdenum" even for stamped markings that would have been easier to change should the need arise. Based on these observations, we think it's likely that the "Chrome Alloy" marking would have been used for most wrenches from about 1935 onward. Since the change in markings probably occurred in stages, as worn forging dies were replaced, a "Mid 1930s" date is probably the most appropriate time expression. J.H. Williams published many catalogs over its long history, and fortunately the catalogs were printed in sufficient quantity so that even the older ones are still relatively available. Major catalog editions were published every few years or so, and update booklets were printed as often as needed to keep up with changes. However, the catalog numbering system changed over the years, making it a bit confusing to keep track of the numerous publications. So to help organize the material, we've arranged our catalog resources into the table below, sorted by issue date. 15th Edition Tools of Industry 1912 Booklet Lists "Vulcan Auto Tool"
17th Edition Superior Drop-Forgings 1919 Booklet Notes Buffalo factory established 1914. 19th Edition Superior Drop-Forgings 1924? Booklet 192 Pages. Alloy steel tappet wrenches in models 90, 92, 94, and 96. 20th Edition Tools of Industry 12/26 Booklet 200 pages. "Superrench" section printed on blue paper. Includes 11/01/1927 revision of "Superrench" section. Notes change to chrome-nickel finishes. A-237 Structural Wrenches 04/29 Booklet Update booklet. A-373 Supersocket Wrenches 10/30 Booklet 20 pages. Update booklet. Earliest known listing of sockets and drive tools. Sockets made of "Chrome-Alloy" steel. Drive sizes 5/16 hex, 3/8, 1/2, and 3/4 square, and 1 inch hex. Sets Nos. 286 and 287A in 5/16-hex drive. Sets Nos. 5 and 5A in 3/8-drive. Sets Nos. 20, 20-A, 20-B, 20-C, 30, and 30-A in 1/2-drive. 21st Edition Tools of Industry 1931? Full-size 216 pages. Undated. "Superrench" tools listed as "Chrome-Alloy". Box-end wrenches note licensed Blackmar patent. 81xx-series single-offset box wrenches available. A-373 Supersocket Wrenches 06/31 Booklet Update booklet. A-341 Superrench 07/31 Booklet Update booklet. A-373 Supersocket Wrenches 01/33 Booklet Update booklet. S-51 "Superratchet" available. Sets Nos. 286 and 289 in 5/16-hex drive. Sets Nos. 5, 5A, 6, and 6A in 3/8-drive. Sets Nos. 20, 20-B, 21, 21-R, and 30 in 1/2-drive. A-341 Superrench 02/33 Booklet Update booklet. A-409 Superrenches+Supersockets 04/37 Booklet 52 pages. Update booklet. "Superrench" tools listed as "Chrome-Molybdenum". Sockets in 9/32, 3/8, 1/2-drive listed as "Chrome-Molybdenum". Sets Nos. 1268P, 1284P, and 1288P in 9/32 square drive. Adjustable wrenches in carbon steel and chrome-alloy steel. 1937 Edition Tools of Industry 06/37 Half-size 184 pages. Sockets in 9/32, 3/8, 1/2-drive listed as "Chrome-Alloy". Sets Nos. 1268P, 1284P, and 1288P in 9/32-drive. X-series 1 inch hex drive still available. A-409 Superrenches+Supersockets 02/40 Booklet Update booklet. Sets Nos. 1268P, 1284P, 1290P in 9/32-drive. NX-series 1 inch square drive available. A-409 Superrenches+Supersockets 03/40 Booklet Update booklet. A-409 Superrenches+Supersockets 05/41 Booklet Update booklet. Sockets and tools in 1/4-drive available, replacing 9/32-drive. Sets Nos. 1269, 1285P, 1286PR, 1291P, 1292PR in 1/4-drive. A-409 Superrenches+Supersockets 11/45 Booklet Update booklet. Industrial Edition Tools of Industry 5/47 Full-size 143 pages. 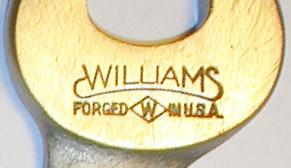 "Williams U.S.A." logo shown on wrench faces. 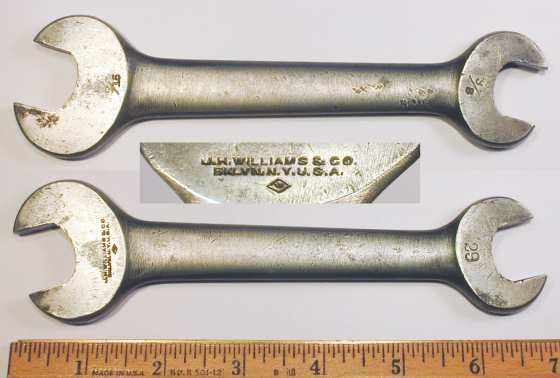 A-50 Superrenches+Supersockets 05/47 Half-Size "Williams U.S.A." logo shown on wrench faces. A-50 Superrenches+Supersockets 04/49 Half-Size Socket sets now S-1, S-2, etc. 1950 Edition Tools of Industry 07/50 Full-size 170 pages. Alloy content listed as "Selected Alloy Steel". Sets NM-1 to NM-8 in 1/4-drive. A-100 Impact Supersockets 10/50 Full-size 15 pages. A-100 Impact Supersockets 10/51 Full-size 27 pages. A-50 Superrenches+Supersockets 03/52 Half-Size Lists ribbed-style ("Streamlined") open-end wrenches. No. 302 Tools of Industry 1956? Full-size 72 pages. Shows box-end and combination wrenches with raised panels. No. 503 Tools of Industry 1959 Half-size 97 pages. Williams Division of United-Greenfield Corporation. Open-end and combination wrenches in flat-shank design. No. 504 Tools of Industry 1960 Half-size 97 pages. Box-end wrenches in flat-shank design. No. 505 Toolpower for Industry 1963 Half-size 97 pages. "Superjustable" wrenches available in industrial finish. No. A-64 Vulcan Tools 1964? Full-size 88 pages. No. 306 Toolpower Catalog 1968 Full-size 104 pages. Sockets made with cold-forming process ("Impact Extruded"). Adjustable wrenches in AP- (chrome) and AB- (industrial) series. No. 307 Toolpower Catalog 1970? Full-size 109 pages. Williams now part of United-Greenfield Division of TRW. Adjustable wrenches with raised ridge around hanging hole. No. 507 Toolpower Catalog 1970? Half-size 129 pages. No. 308 Toolpower Catalog 1974? Full-size 121 pages. No cross-bar hole on 1 inch drive sockets. No. 309 Toolpower Catalog 1978 Full-size 129 pages. J.H. Williams Division of TRW. Williams tools were offered by many industrial and automotive supply companies, and the catalogs from these companies provide valuable references for Williams tools. The list below includes some of the catalogs that have proven to be useful, but there are likely many more as well. Ducommun "E" 1918. The 1918 catalog "E" from the Ducommun Hardware Company of Los Angeles has extensive listings for J.H. Williams wrenches on pages 225 through 236, with an early set of tappet wrenches shown at the bottom of page 236. Other tools include Vulcan chain pipe wrenches on page 256 and Vulcan pipe vises on page 265. Dunham, Carrigan Catalog 1925. The 1925 catalog No. 73 from the Dunham, Carrigan & Hayden Company shows six pages of Williams tools, beginning on page 220. The listings (all for wrenches) show only carbon-steel tools, with the exception of four alloy-steel tappet wrenches, models 90, 92, 94, and 96. White Tool and Supply 1928. The 1928 catalog "B" from the White Tool and Supply Company, a Cleveland-based industrial distributor, lists Williams wrenches on pages 127 through 135. The listings include chrome-molybdenum alloy steel wrenches in three styles, engineers', "S"-shaped, and tappet wrenches. The listings also include Vulcan pipe tongs on page 137. C.W. Marwedel 1929. The C.W. Marwedel catalog No. 12 of 1929 lists Williams wrenches on pages 70 through 82, including the chrome-molybdenum Superrench line in Engineers', tappet, S-shaped, obstruction, and midget styles. Page 82 lists Williams-Husky wrench sets with Nos. 287, 321-1/2, and 642-1/2 sets. H. Channon 1930. The 1930 catalog No. 101 from the H. Channon Company lists a wide variety of Williams tools, including "Superrench" open-end and tappet wrenches, carbon steel wrenches, and automotive wrench sets. One of the more interesting items listed is the "Combination Electrical Set 287", a set of midget Superrenches plus eight small hex-drive sockets, a sliding T-handle, and a rotating-grip extension. This is the earliest known catalog listing for interchangeable sockets from Williams; even more interesting, the model numbers and illustrations of the T-handle and extension exactly match the Husky Wrench L-2 T-Handle and Husky Wrench L-147 Rotating-Grip Extension. Ducommun "H" 1933. The 1933 catalog "H" from the Ducommun Corporation lists a variety of Williams tools beginning on page 136, including the "Superrench" line in open-end, obstruction, and box-end styles. "Duohex" box-end wrenches are listed in both single-offset and double-offset styles. Four pages of Williams socket sets are listed beginning on page 144A, including sets with 1 inch hex drive. Page 136 shows a rare table of Williams "Volume" open-end wrenches, which notes the construction from chrome-molybdenum steel. This is currently our only catalog reference for the "Volume" brand. H. Channon 1936. The catalog No. 102 from the H. Channon Company (undated but from around 1936) lists a variety of Williams tools, including the only known descriptions of the M-310 (9/32-drive) and B-315 (3/8-drive) socket sets. The product lines include "Superrench" open-end, tappet, and box-end wrenches, carbon steel wrenches, automotive wrench sets, and socket tools from 9/32-drive up to 1 inch hex drive. A hint for the publication date is provided on page 199, which mentions the use of the Williams SD-1228T socket for Buick cars up to 1936. Another listing unique to this catalog is the "Cromal" second-line of box wrenches, not specifically marked as Williams but appearing in the middle of the section. The wrenches were offered in four sets, Nos. 176, 185, 186, and 193, and were described as chrome-alloy steel with cadmium plating. The earliest tools produced by Williams were generally marked with "J.H. Williams & Co." and "Bklyn, N.Y. U.S.A." stamped on the face, or with similar markings forged into the tool. In some cases only the W-Diamond logo was marked on the tool. J.H. Williams became an early leader in the market for chain pipe wrenches, and developed or licensed a number of patents for such tools. We'll begin this section with an early example of one of their chain wrenches. Fig. 6. Williams No. 0 Brock Patent Chain Wrench, with Inset for Side View, ca. 1888-1895. Fig. 6 shows an early Williams No. 0 chain wrench, marked with the W-Diamond logo and "Brock Chain Wrench" on the face plate, and with "Made By J.H. Williams & Co" and "Brooklyn, N.Y. U.S.A." forged into the handle. The overall length is 12.5 inches, and the finish is plain steel. The face plate also lists no fewer than five patent dates, which must be something of a record. The dates and patents are Oct. 4, 1881 (Brock, #247,987), Dec. 13, 1881 (Brock, #250,641), Mar. 14, 1882 (Brock, #254,862), May 13, 1884 (Brock, #298,442). and Feb. 14, 1888 (Williams, #377,795). Fig. 7. Williams No. 30 Vulcan Chain Pipe Wrench, with Inset for Side View, ca. 1908-1920. Fig. 7 shows a later Vulcan No. 30 "Bijaw" chain pipe wrench, marked "J.H. Williams & Co" and "Brooklyn, N.Y. U.S.A." with the W-Diamond logo forged into the face plate. The face is also marked with a "Pat'd in U.S. Jan. 21 08" and several foreign patent notices. The overall length is 13.7 inches, and the finish is plain steel. Fig. 8. Williams Vulcan Auto Tool, with Insets for Reverse Detail, ca. 1910-1915. Fig. 8 shows the distinctive Williams "Vulcan Auto Tool", a combination tool for auto repair. The tool has forged-in markings "J.H. Williams & Co." and "Brooklyn, N.Y. U.S.A." with the W-Diamond logo, and the reverse is marked "Vulcan Auto Tool" and "Pat. Pendg." (see insets). The patent corresponding to the pending notice has not yet been found. The Vulcan Auto wrench was offered in the J.H. Williams Fifteenth Edition catalog of 1912, and description lists 12 different functions performed by the tool, with an annotated illustration to point out the operations. The catalog also states that the tool was patented. The price was $12.00 per dozen in either blued or nickel-plated finish. Advertisements for this tool have been found as early as 1910. The February 1910 edition of the Hardware Dealer's Magazine has an illustration of the Vulcan Auto Tool on page 375 in the "New Goods" section, suggesting that the tool was introduced around this time. Another advertisement in the January 1910 Proceedings of the Brooklyn Engineers Club provides a functional illustration of the various parts of the Vulcan Auto tool. Open-end wrenches were among the early tools produced by J.H. Williams, and the model numbering system developed for open-end wrenches became widely adopted by the industry. Fig. 9. Williams Early "White" No. 729 5/8x3/4 Open-End Wrench, ca. Before 1914. Fig. 9 shows an early Williams No. 729 5/8x3/4 open-end wrench, apparently made for the White company (possibly the truck manufacturer). The face is stamped "J.H. Williams & Co." and "Bklyn. N.Y. U.S.A." on one end with the 729 model number on the other, and the "White" name is engraved in script on the shank. The shank also has a forged-in "29" and a W-Diamond logo, but the latter has been partially ground off. The reverse faces are stamped "7/16" and "1/2", references to the older S.A.E. size convention. Fig. 10. Early Williams No. 29 11/16x25/32 Open-End Wrench, with Insets for Reverse and Marking Detail, ca. Before 1914. Fig. 10 shows an early Williams No. 29 11/16x25/32 open-end wrench, stamped "J.H. Williams & Co." and "Bklyn. N.Y. U.S.A." with the W-Diamond logo on the face. The reverse faces are stamped "7/16" and "3/8", references to the older U.S.S. Size Convention for the 25/32 and 11/16 openings, respectively. Fig. 11. Early Williams No. 731B 13/16x7/8 Open-End Wrench, with Inset for Side View, ca. Before 1914. Fig. 11 shows an early Williams No. 731B 13/16x7/8 open-end wrench, stamped "J.H. Williams & Co." and "Bklyn, N.Y. U.S.A." on one face with the model number on the other end. The shank also has a forged-in W-Diamond logo at the left. The reverse faces are stamped "9/16" and "5/8", references to the older Hex Capscrew size convention. Fig. 12. Early Williams No. 679A "A.L.A.M. STD." 9/16x11/16 S-Shaped Open-End Wrench, with Inset for Reverse, ca. 1910-1913. Fig. 12 shows an early Williams No. 679A 9/16x11/16 S-shaped open-end wrench, stamped with "J.H. Williams & Co." and "Bklyn, N.Y. U.S.A." on the face, with "A.L.A.M. STD." stamped on the shank. The reverse faces are stamped "7/16" and "3/8", and the reverse shank has a forged-in W-Diamond logo at the left. This wrench is listed in the 1912 Williams catalog as part of the No. 2 "Light" Automobile Set, with the openings described as fitting "A.L.A.M. Standard Nuts". Although the A.L.A.M. size convention is usually associated with the later S.A.E. sizes, the "7/16" marking for an 11/16 opening is not part of the S.A.E. convention. Fig. 13. Williams 761 Special 7/16x1/2 Textile-Pattern Open-End Wrench, with Insets for Marking Detail, ca. Early 1900s. Fig. 13 shows an early Williams 761 Special 7/16x1/2 textile-pattern wrench, stamped "J.H. Williams & Co." and "Bklyn, N.Y. U.S.A." on one face, with "Special" on the other face. The shank has a forged-in W-Diamond logo and is also stamped "S.L.S. ", and the reverse has a forged-in "761" model number. Fig. 14. Williams 761C 19/32x11/16 Textile-Pattern Open-End Wrench, with Inset for Reverse Detail. Fig. 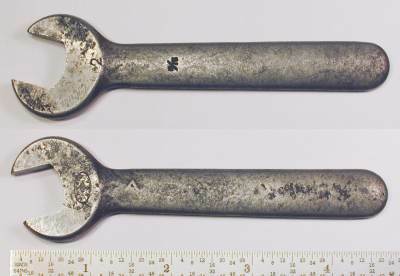 14 at the left shows an early Williams 761C 19/32x11/16 textile-pattern wrench, stamped "J.H. Williams & Co." and "Bklyn, N.Y. U.S.A." on the face, with the W-Diamond logo forged into the shank. The reverse faces are marked "5/16" and "3/8", references to the older U.S.S. size convention. In 1914 J.H. Williams built a new factory in Buffalo, New York, a location favored by many metal industries for its abundant electricity and good transportation. Williams continued to use the Brooklyn facility for some time, but eventually moved its headquarters to Buffalo. In 1924 Williams began using the "Williams Scroll" trademarked logo, composed of the Williams name underlined on top with "Forged in U.S.A." and the W-Diamond logo underneath. This marking remained in use until 1947. In this section we'll look at examples of carbon-steel tools produced from around 1914 up through 1947. We'll now turn to some early wrenches marked with the JHW-Brooklyn logo. Fig. 15. Williams No. 723A "Pierce-Arrow" 3/8x1/2 Open-End Wrench, with Inset for Reverse Detail, ca. 1914-1924. Fig. 15 shows an early Williams No. 723A 3/8x1/2 open-end wrench, stamped with the JHW-Brooklyn logo on the face, with the industry-standard model number on the other face. The reverse shank is stamped with the "Pierce-Arrow" logo, indicating that this wrench was contract production for the Pierce company. The overall length is 3.9 inches, and the finish is plain steel with polished faces. The reverse faces are stamped "3/16" and "5/16", references to the older Hex Cap Screw size convention. Fig. 16. Williams No. 725 7/16x1/2 Open-End Wrench, with Insets for Marking Detail, ca. 1914-1924. Fig. 16 shows an early Williams No. 725 7/16x1/2 open-end wrench, stamped with the JHW-Forged logo on the face, but with the company name in the "J.H.W." abbreviated form. The reverse face is stamped with the industry-standard model number, but the opening sizes are not marked. The overall length is 4.8 inches, and the finish is plain steel with polished faces. Fig. 17. Williams No. 25 1/2x19/32 Open-End Wrench, with Inset for Reverse, ca. 1914-1924. Fig. 17 shows an early Williams No. 25 1/2x19/32 open-end wrench, stamped with the JHW-Forged logo on the face, but with the company name in the "J.H.W." abbreviated form. The shank is marked with the W-Diamond logo forged into the front, with the "25" model number forged into the reverse. The reverse faces are stamped "5/16" and "1/4", references to the older U.S.S. Size Convention. The next two figures show early examples of the No. 726 wrench. Fig. 18. Williams No. 726 1/2x5/8 Open-End Wrench, with Inset for Reverse Detail, ca. 1914-1924. Fig. 18 shows an early Williams [No. 726] 1/2x5/8 open-end wrench, stamped with the JHW-Brooklyn logo on the face, and with the W-Diamond logo forged into the shank. The reverse shank also has a forged-in number "128" as shown in the inset. 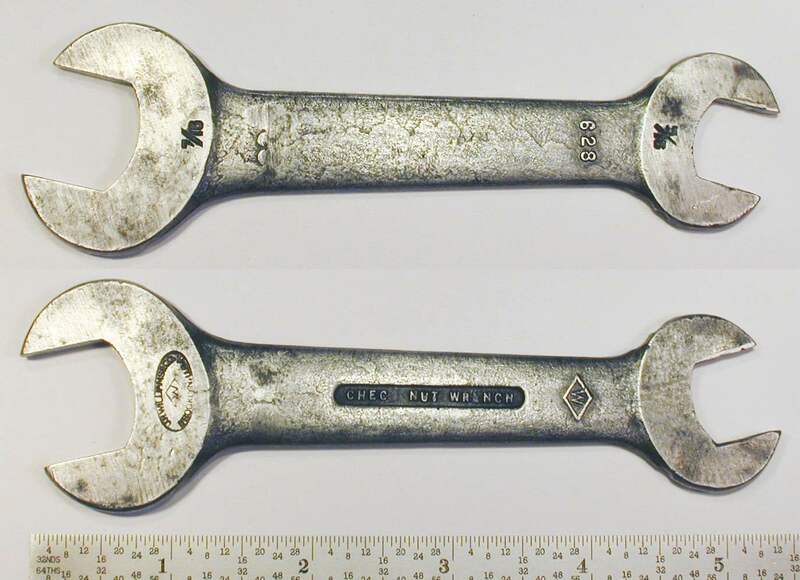 The reverse faces are stamped "5/16" and "7/16", references to the older Hex Capscrew size convention for an industry-standard 726 wrench. Fig. 19. Williams No. 726 1/2x5/8 Open-End Wrench, with Inset for Reverse Detail, ca. 1914-1924. Fig. 19 shows another early Williams No. 726 1/2x5/8 open-end wrench, marked with the JHW-Forged logo stamped on the face, and with the W-Diamond logo forged into the shank. The reverse face is stamped with the 726 model number, but the sizes are not marked. Fig. 20. Williams No. 27 19/32x11/16 Open-End Wrench, with Insets for Side View and Marking Detail, ca. 1914-1924. Fig. 20 shows an early Williams No. 27 19/32x11/16 open-end wrench, stamped with the JHW-Forged logo on the face, and with the W-Diamond logo forged into the shank. The shank also has a stamped marking "Kelly Press", which was probably the customer for contract production, and the reverse side has a forged-in number "27" (see lower inset). The middle insets show the reverse face markings "3/8" and "5/16", references to the older U.S.S. size convention for an industry-standard 27 wrench. The upper inset shows a side view of the wrench. Note the grinding marks on the edge, indicating that only relatively coarse finishing operations were being performed at this time. The next figures show two examples of early No. 29 wrenches. Fig. 21. Williams No. 29 11/16x25/32 Open-End Wrench, with Inset for Reverse Detail, ca. 1914-1924. Fig. 21 shows an early Williams No. 29 11/16x25/32 open-end wrench, stamped with the JHW-Forged logo on one face. The shank has the W-Diamond logo forged into one side, with the industry-standard model number 29 forged into the reverse, as shown in the inset. The reverse faces are marked "3/8" and "7/16", references to the older U.S.S. size convention. Fig. 22. Williams No. 29 11/16x25/32 Open-End Wrench, ca. 1914-1924. Fig. 22 shows a somewhat later Williams No. 29 11/16x25/32 open-end wrench, stamped with the JHW-Brooklyn logo on one face, with the model number stamped on the other end. Fig. 23. Williams No. 731 3/4x13/16 Open-End Wrench, ca. 1914-1924. Fig. 23 shows an early Williams No. 731 3/4x13/16 open-end wrench, marked with the W-Diamond logo forged into the shank, and with the JHW-Forged logo on one face. The industry-standard model number 731 is stamped on the other front face. The reverse faces are marked "1/2" and "9/16", references to the older U.S.S. size convention. The use of a stamped rather than forged-in model number suggests later production than the previous example. Fig. 24. Williams No. 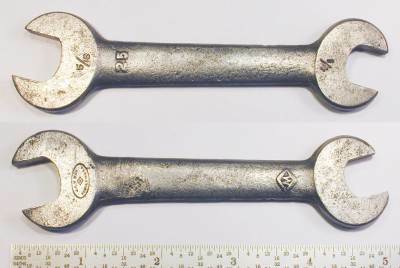 33 7/8x31/32 Open-End Wrench, with Insets for Side View and Reverse Detail, ca. 1914-1924. Fig. 24 shows an early Williams No. 33 7/8x31/32 open-end wrench, stamped with the JHW-Brooklyn logo on the face, and with the W-Diamond logo forged into the shank. The industry-standard model number is forged into the reverse side of the shank, as shown in the inset. The middle insets show the reverse face markings "9/16" and "1/2", references to the older U.S.S. size convention. The upper inset shows a side view of the wrench, illustrating the coarse grinding marks remaining after the finishing operations. The rough finish indicates a relatively early production date for this example. Fig. 25. Williams No. 34 7/8x1-1/16 Open-End Wrench, with Insets for Reverse and Marking Detail, ca. 1914-1924. Fig. 25 shows an early Williams No. 34 7/8x1-1/16 open-end wrench, stamped with the JHW-Brooklyn logo on the face, with the model number on the opposite end. The reverse faces are stamped "5/8" and "1/2", references to the older U.S.S. Size Convention for the 1-1/16 and 7/8 openings, respectively. Fig. 26. Williams No. 35 31/32x1-1/16 Open-End Wrench, ca. 1914-1924. Fig. 26 shows an early Williams No. 35 31/32x1-1/16 open-end wrench, stamped with the JHW-Brooklyn logo on the face, and with the W-Diamond logo forged into the shank. The industry-standard model number is forged into the reverse side of the shank, as shown in the inset. The reverse faces are marked "9/16" and "5/8", references to the older U.S.S. size convention. Fig. 27. Williams No. 737 1-1/8x1-1/4 Open-End Wrench, with Inset for Marking Detail, ca. 1914-1924. Fig. 27 shows an early Williams No. 737 1-1/8x1-1/4 open-end wrench, stamped with the JHW-Forged logo on the face, and with a W-Diamond logo forged into the shank. The industry-standard model number 737 is stamped on the reverse face (not shown). Fig. 28. Williams 1474 5/8x11/16 Open-End Wrench, ca. 1914-1924. Fig. 28 shows a Williams 1474 5/8x11/16 open-end wrench, stamped with the JHW-Brooklyn logo on the face. Later carbon-steel wrenches were marked on the face with the Williams scroll trademark, plus "Forged in U.S.A." and the W-Diamond logo. This type of marking was used beginning in 1924, the date listed on the Williams scroll trademark registration. Fig. 29. Williams No. 725 7/16x1/2 Open-End Wrench, with Insets for Reverse and Side View, ca. 1924-1927. Fig. 29 shows a Williams No. 725 7/16x1/2 open-end wrench, stamped "Forged in U.S.A." with the W-Diamond logo on the face, with the model number stamped on the shank. The overall length is 4.9 inches, and the finish is plain steel with traces of black paint on the shank. The reverse faces are stamped "1/4 [HEX]C 1/4 S.A.E." and "1/4 U.S.S. 5/16 [HEX]C 5/16 S.A.E. ", references to the older side conventions. The markings on this particular wrench provide a fairly precise estimate of the manufacturing date. The Williams scroll trademark on the face indicates production in 1924 or later, and the use of the older U.S.S. and S.A.E. size conventions places the production in 1927 or earlier. A somewhat earlier example of this model can be seen as the Williams 725 Open-End Wrench. Fig. 30. Williams No. 727 9/16x5/8 Open-End Wrench, ca. 1927-1947. Fig. 30 shows a Williams No. 727 9/16x5/8 open-end wrench, stamped "Forged in U.S.A." with the W-Diamond logo on the face, with the model number stamped on the shank. The reverse faces are stamped with the fractional sizes (not shown). The overall length is 6.3 inches, and the finish is black paint with polished faces. Fig. 31. Williams No. 30 11/16x7/8 Open-End Wrench, ca. 1927-1947. Fig. 31 shows a Williams No. 30 11/16x7/8 open-end wrench, stamped on the face with "Forged in U.S.A." and the W-Diamond logo. The overall length is 8.5 inches, and the finish is plain steel with traces of black paint on the shank. The reverse faces are marked with the fractional sizes of the openings. Fig. 32. Williams No. 31 25/32x7/8 Open-End Wrench, ca. 1927-1947. Fig. 32 shows a Williams No. 31 25/32x7/8 open-end wrench, stamped "Forged in U.S.A." with the W-Diamond logo on the face. The overall length is 9.1 inches, and the finish is plain steel with traces of black paint on the shank. Fig. 33. Williams No. 41 "Mack" 1-7/16x1-5/8 Open-End Wrench, with Insets for Reverse Detail, ca. 1924-1927. Fig. 33 shows a Williams No. 41 1-7/16x1-5/8 open-end wrench, stamped "Forged in U.S.A." with the W-Diamond logo on the face, and stamped with the Mack script logo on the shank. The overall length is 15.4 inches, and the finish is plain steel. The insets show the reverse face markings "1 U.S.S. 1 1/8 [HEX]C 1 1/8 S.A.E." and "7/8 U.S.S. 1 S.A.E. ", references to the older U.S.S., Hex Capscrew, and S.A.E. size conventions. Single-open "Engineer's" wrenches were actually the first tools offered by Williams, at least if we use the model numbers as a guide. When the numbering system was laid out, single-open wrenches for U.S.S. bolts were assigned numbers 1 through 20, with the U.S.S. double-open wrenches picking up at number 21. A second series of single-open wrenches for the Hex Cap Screw sizes was introduced later, with model numbers running in a 700 series. Fig. 34. Williams No. 2 19/32 Single-Open Engineer's Wrench, with Inset for Reverse, ca. 1914-1924. Fig. 34 shows an early Williams No. 2 19/32 single-open wrench, stamped with the abbreviated JHW-Brooklyn logo on the face, and with the W-Diamond logo forged into the shank. The reverse shank is stamped with the size as "5/16", a reference to the U.S.S. Size Convention for the 19/32 opening. Fig. 35. Williams No. 3 11/16 Single-Open Engineer's Wrench, with Inset for Reverse Detail, ca. 1914-1924. Fig. 35 shows an early Williams No. 3 11/16 single-open wrench, stamped with the JHW-Brooklyn logo on the face, and with the W-Diamond logo forged into the shank. Fig. 36. Williams No. 704 3/4 Single-Open Engineer's Wrench, ca. 1924-1947. Fig. 36 shows a later Williams No. 704 3/4 single-open wrench, stamped "Forged in U.S.A." with the W-Diamond logo on the face, and with the model number stamped into the shank. The overall length is 7.2 inches, and the finish is plain steel with traces of the original black paint. Fig. 37. Williams No. 5 7/8 Single-Open Engineer's Wrench, with Inset for Reverse Detail, ca. 1927-1947. Fig. 37 shows a Williams No. 5 7/8 single-open wrench, stamped "Forged in U.S.A." with the W-Diamond logo on the face, and with the model number stamped into the shank. The reverse face is stamped with the fractional size. Fig. 38. Williams No. 6 31/32 Single-Open Engineer's Wrench, with Inset for Reverse Detail, ca. 1924-1927. Fig. 38 shows a Williams No. 6 31/32 single-open wrench, stamped "Forged in U.S.A." with the W-Diamond logo on the face, and with the model number stamped into the shank. The reverse face is stamped with the size as "9/16 U.S.S. ", a reference to the older U.S.S. Size Convention. The use of the Williams scroll face logo with the older U.S.S. size convention indicates production in the range 1924-1927. The next figures show examples of textile-pattern open-end wrenches, tools that were often used for servicing looms and other textile machinery. Fig. 39. Williams 762 Special "Johnson & Bassett" Textile Wrench, with Inset for Reverse Detail. Fig. 39 shows a Williams 762 "Special" textile-pattern wrench with measured sizes 5/8x23/32, stamped on the face "Forged in U.S.A." with the W-Diamond logo. The reverse shank is stamped "Johnson & Bassett", presumed to be the customer for this special-order wrench. The next figures show two generations of the Williams 762C textile wrench. Fig. 40. Williams 762C 11/16x7/8 Textile-Pattern Open-End Wrench, with Inset for Reverse Detail. Fig. 40 at the left shows an early Williams 762C 11/16x7/8 textile-pattern wrench, stamped "J.H. Williams & Co." and "Bklyn, N.Y. U.S.A." on the face, with the W-Diamond logo forged into the shank. The reverse faces are stamped "3/8" and "1/2", references to the opening sizes in the old U.S.S. size convention. Fig. 41. Williams 762C 11/16x7/8 Textile-Pattern Open-End Wrench. Fig. 41 at the left shows a later Williams 762C wrench, stamped "Forged in U.S.A. on the face with the W-Diamond logo. Fig. 42. Williams 763A 25/32x7/8 Textile-Pattern Open-End Wrench, with Inset for Reverse, ca. 1914-1924. Fig. 42 shows a Williams 763A 25/32x7/8 textile-pattern wrench, stamped with the JHW-Brooklyn logo on the face. The reverse faces are stamped "1/2" and "7/16", references to the U.S.S. Size Convention for the 7/8 and 25/32 sizes, respectively. Fig. 43. Williams [763A] 25/32x7/8 Textile-Pattern Open-End Wrench for Crompton & Knowles, with Inset for Reverse and Marking Detail, ca. 1914-1924. Fig. 43 shows another Williams [763A] 25/32x7/8 textile-pattern wrench, made as contract production for Crompton & Knowles, a maker of textile machinery. The face is stamped with the JHW-Forged logo, and the shank is stamped "Crompton & Knowles 6" for the customer's model. The reverse faces are stamped "7/8" and "25/32", the actual across-flats size. Fig. 44. Williams 525 1/4x5/16 Toolpost Wrench, with Inset for Reverse Detail, ca. 1914-1924. Fig. 44 at the left shows a Williams 525 1/4x5/16 toolpost wrench, marked with the W-Diamond logo forged into the shank, and with the abbreviated variant of the JHW-Brooklyn logo stamped on the face. The overall length is 3.9 inches. Fig. 45. Williams 529 3/8x7/16 Toolpost Wrench, with Insets for Marking Detail, ca. 1914-1924. Fig. 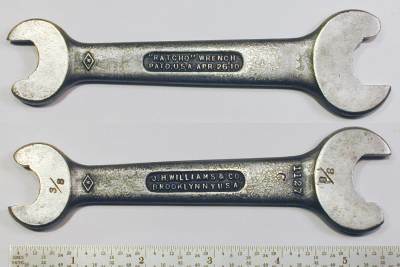 45 at the left shows an early Williams 529 3/8x7/16 toolpost wrench, marked with the W-Diamond logo forged into the shank, and with the abbreviated variant of the JHW-Brooklyn logo stamped on the face. The overall length is 5.8 inches. The finish is plain steel with some traces of the original black paint. Fig. 46. Williams 529 3/8x7/16 Toolpost Wrench. Fig. 46 shows a later Williams 529 3/8x7/16 toolpost wrench, marked with the W-Diamond logo forged into the shank, and with "Made U.S.A." and the W-Diamond logo stamped on the face. Fig. 47. Williams 595 "Skinner Chuck" 3/8x11/16 Toolpost Wrench, with Insets for Reverse and Marking Detail, ca. 1924-1947. Fig. 47 shows a Williams 595 3/8x11/16 toolpost wrench made for the Skinner Chuck Company. The wrench is marked with "Made U.S.A." and the W-Diamond logo stamped on the face, with the W-Diamond logo forged into the shank. The reverse faces are stamped with the fractional sizes, and the reverse shank is stamped "The Skinner Chuck Co.", presumed to be the customer for the wrench. The overall length is 6.5 inches, and the finish is black paint. Fig. 48. Williams 556 5/8 Open-Box Toolpost Wrench, with Inset for Side View, ca. 1914-1924. Fig. 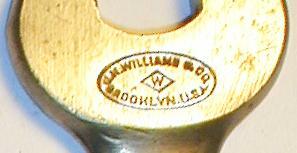 48 shows a Williams 5/8 toolpost wrench in the open-box style, marked with a variant of the JHW-Brooklyn logo with abbreviated names. The top inset shows a side view of the wrench, illustrating the massive construction typical for this type of tool. 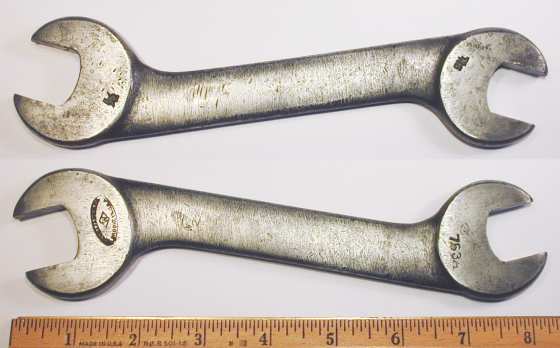 Check-nut wrenches were the forerunners of the modern tappet wrench, a type of thin open-end wrench designed to service opposing nuts on a variety of machinery. Single-ended check-nut wrenches were being offered as early as 1901 in the Tenth Edition catalog. Wrenches as that time were available in models ranging from No. 602 (5/16 U.S.S.) up to No. 610 (1 Inch U.S.S.). Fig. 49. Williams 624 13/32x19/32 Check-Nut Wrench, with Inset for Reverse Detail, ca. 1914-1924. Fig. 49 shows a Williams 624 13/32x19/32 check-nut wrench, stamped "J.W.H. & Co." in a variant JHW-Brooklyn logo on one face. The shank has a depressed panel with "Check Nut Wrench" and a raised W-Diamond logo at the end, and the reverse has the forged-in "624" model number. The reverse faces are marked "3/16" and "5/16", references to the older U.S.S. Size Convention. Fig. 50. Williams 624 13/32x19/32 Check-Nut Wrench, with Inset for Reverse, ca. 1914-1924. Fig. 50 shows a Williams 625 1/2x19/32 check-nut wrench, stamped "J.W.H. & Co." in a variant JHW-Brooklyn logo on one face. The shank is marked with "Check Nut Wrench" forged into a depressed panel and a W-Diamond logo forged at the end, with the "625" model number forged into the reverse. The reverse faces are marked "5/16" and "1/4", references to the older U.S.S. Size Convention. Fig. 51. Williams 628 19/32x25/32 Check-Nut Wrench, with Inset for Reverse. Fig. 51 shows a Williams 628 19/32x25/32 check-nut wrench, stamped with the JHW-Brooklyn logo on one face. The shank has a depressed panel with "Check Nut Wrench" and a raised W-Diamond logo at the end, and the reverse has the forged-in "628" model number. The inset shows the reverse face markings "7/16" and "5/16", references to the wrench sizes in the older U.S.S. convention. Fig. 52. Williams 632 25/32x31/32 Check-Nut Wrench. Fig. 52 shows a Williams model 632 check-nut wrench with sizes 25/32 and 31/32, marked with the JHW-Brooklyn logo on one face. The shank has several forged-in markings, including the "632" model number at one end, a depressed panel with "Check Nut Wrench" in the center, and the W-Diamond logo at the other end. The reverse faces are marked "7/16" and "9/16", references to the wrench sizes in the U.S.S. convention. Fig. 53. Williams 635E 1x1-1/4 Check-Nut Wrench, with Inset for Marking Detail. The overall length is 10.4 inches, and the finish is plain steel, possibly with black paint originally. The reverse faces are marked "3/4" and "1", apparent references to the older "Hex Cap Screw" size convention. The next several figures show later examples of the check-nut series. Fig. 54. Williams 633 "Mack" 7/8x1 Check-Nut Wrench, ca. 1927-1947. Fig. 54 shows a later Williams 633 7/8x1 check-nut wrench made for Mack. The face is stamped "Forged in U.S.A." with the W-Diamond logo, and the shank is stamped with the Mack script logo. Fig. 55. Williams 634 7/8x1-1/16 Check-Nut Wrench, with Insets for Side View and Reverse Detail, ca. 1924-1927. Fig. 55 shows an earlier Williams 634 7/8x1-1/16 check-nut wrench, stamped "Forged in U.S.A." with the W-Diamond logo on the face, with the model number stamped on the shank. The insets show the reverse face markings "5/8 U.S.S. 3/4 S.A.E." and "1/2U.S.S. 5/8 [HEX]C 9/16 S.A.E. ", references to the older size conventions. The markings on this wrench allow us to make a reasonably precise estimate of the manufacturing date. The Williams scroll trademark on the face indicates production in 1924 or later, and the use of the older U.S.S. and S.A.E. size conventions places the production in 1927 or earlier. Fig. 56. Williams 634 7/8x1-1/16 Check-Nut Wrench, with Insets for Side View and Reverse Detail, ca. 1942-1945. Fig. 56 shows a later Williams 634 7/8x1-1/16 check-nut wrench, stamped "Forged in U.S.A." with the W-Diamond logo on the face. The shank is stamped with the model number, and the reverse shank has a forged-in code "T" (see lower inset). The shank of this wrench is rough and irregular, suggesting that the forged metal didn't quite fill the die. The finish is also fairly rough, with plainly visible grinding marks on the edge (see top inset). The rough finish suggests production during the 1942-1945 wartime years, when shortages of materials or labor required compromises in quality. This next example, while not strictly a check-nut wrench, is similarly thin and was designed for a specialized automotive application. Fig. 57. Williams 990 5/8x5/8 Angle-Head Wrench, with Insets for Reverse and Marking Detail, ca. 1924-1927. Fig. 57 shows a Williams 990 5/8x5/8 "Brake Adjustment" angle-head wrench, stamped "Made U.S.A." with the W-Diamond logo on the face (see center inset). The reverse faces are stamped "7/16 S.A.E. 7/16 CAP" on both ends, references to the older S.A.E. and Hex Capscrew Size Conventions. The shank is stamped with "Brake Adjustment", the presumed application for this early angle-head or obstruction wrench. The overall length is 6.2 inches, and the finish is plain steel with traces of black paint. The Williams scroll logo and S.A.E. size markings allow a fairly precise 1924-1927 estimate of the manufacturing date. A later version of this wrench (in chrome-moly steel) can be seen as the Williams 1990 Brake Wrench, and a later wrench for a similar application can be seen as the Williams 1990 "Special" (A183907) Brake Wrench. Williams produced S-shaped open-end wrenches in several product lines, with the 66x series being probably the most familiar. This series is almost comical in its use of letter suffixes, as more and more sizes were squeezed into the originally small series. The next several figures show examples of the Williams 662D wrench. Fig. 58. Williams 662D 7/16x1/2 S-Shaped Wrench, with Inset for Reverse, ca. 1914-1924. Fig. 58 shows an early Williams 662D 7/16x1/2 S-shaped wrench, stamped with the JHW-Brooklyn logo on the face, with the "662" model number forged into the shank. (The "D" suffix is stamped.) The reverse faces are stamped "5/16" and "1/4", references to the older S.A.E. or Hex Capscrew Size Conventions. The overall length is 4.9 inches, and the finish is plain steel, with extensive pitting due to rust. Fig. 59. Williams 662D 7/16x1/2 S-Shaped Wrench, ca. 1914-1924. Fig. 59 shows a Williams 662D 7/16x1/2 S-shaped wrench, stamped with the JHW-Brooklyn logo on the face. The overall length is 4.9 inches, and the finish is plain steel with polished faces. The reverse faces are stamped "1/4" and "5/16", references to the older Hex Capscrew sizing convention. This wrench has an unusually clear "Brooklyn" logo, so this image was used for our table of logos. Fig. 60. Williams 662D 7/16x1/2 S-Shaped Wrench, with Inset for Reverse Detail, ca. 1927-1947. Fig. 60 shows a later Williams 662D 7/16x1/2 S-shaped wrench, stamped "Made U.S.A." with the W-Diamond logo on the face, and with a "T" code forged into the reverse shank. Fig. 61. Williams 662F 1/2x9/16 S-Shaped Wrench, ca. 1927-1947. Fig. 61 at the left shows a Williams 662F 1/2x9/16 S-shaped wrench, stamped "Made U.S.A." with the W-Diamond logo on the face. The reverse shank also has a forged-in "T" code. Fig. 62. Williams 662B 1/2x19/32 S-Shaped Wrench, with Insets for Reverse Detail, ca. 1914-1924. Fig. 62 at the left shows a Williams 662B 1/2x19/32 S-shaped wrench, stamped with the JHW-Brooklyn logo on one face, and with the W-Diamond logo forged into the shank. The insets show the reverse face markings "5/16" and "1/4", implicit references to the older U.S.S. size convention. Fig. 63. Williams 663E 9/16x3/4 S-Shaped Wrench, ca. 1924-1927. Fig. 63 at the left shows a Williams 663E 9/16x3/4 S-shaped wrench, stamped "Forged in U.S.A." with the W-Diamond logo on the face. The overall length is 6.2 inches, and the finish is black paint with polished faces. The reverse faces are stamped "3/8 S.A.E." and "1/2 S.A.E. ", references to the older size convention. The use of S.A.E. opening sizes with the Williams Scroll face markings indicates production in the range 1924-1927. The next figures show two versions of the Williams 664A S-shaped wrench. Fig. 64. Williams 664A 11/16x7/8 S-Shaped Wrench, with Inset for Reverse Detail. Fig. 64 at the left shows a Williams 664A 11/16x7/8 S-shaped wrench, marked with the JHW-Brooklyn logo on one face, and with the W-Diamond logo forged into the shank. The inset shows the forged-in "664" in the reverse with a stamped "A" code. Fig. 65. Williams 664A 11/16x7/8 S-Shaped Wrench, with Inset for Reverse Detail. Fig. 65 shows a very similar Williams 664A S-shaped wrench, but stamped with the JHW-Forged logo instead of the Brooklyn variant. The "664" base model number is forged into the shank with the "A" suffix stamped, and with the W-Diamond logo forged into the other end. The inset shows a close-up of the stamped JHW-Forged logo. In addition to the 66x series, Williams also produced an 86x series of heavy-duty S-shaped wrenches with concave handles. These were listed in the 1912 catalog as '"S" Wrenches with Concave Handles', and were available in sizes for both square toolpost nuts and hexagon head cap screws. Fig. 66. Williams 864F 9/16x3/4 S-Shaped Wrench, with Inset for Reverse Detail. Fig. 66 shows a Williams 864A 9/16x3/4 S-shaped wrench with a concave panelled shank, marked with the abbreviated variant of the JHW-Brooklyn logo on the face, and with the model number "864" forged into the shank. (The "F" suffix is stamped.) A forged-in W-Diamond logo also appears on the reverse shank. Williams also produced "S" wrenches in a series typically numbered 75B, 77B, 79, 81B, and 83B, but with letter variants and sometimes with a 600 prefix appended. (An earlier example was shown as the Williams 679A A.L.A.M. Wrench.) The next several figures shows examples of these wrenches. Fig. 67. Williams 79S Mack 9/16x5/8 S-Shaped Wrench, with Insets for Reverse Detail, ca. 1924-1927. Fig. 67 shows a Williams 79S 9/16x5/8 S-shaped wrench made for Mack, stamped "Forged in U.S.A." with the W-Diamond logo on the face, and with the model number and the Mack script logo on the shank. The insets show the reverse face markings "7/16 [HEX]C 7/16 S.A.E." and "3/8 [HEX]C 3/8 S.A.E. ", references to the older S.A.E. and Hex Capscrew size conventions. The use of the older S.A.E. size convention with the Williams Scroll face markings indicates production in the range 1924-1927. Fig. 68. Williams 83B 7/8x1 S-Shaped Open-End Wrench, ca. 1914-1924. Fig. 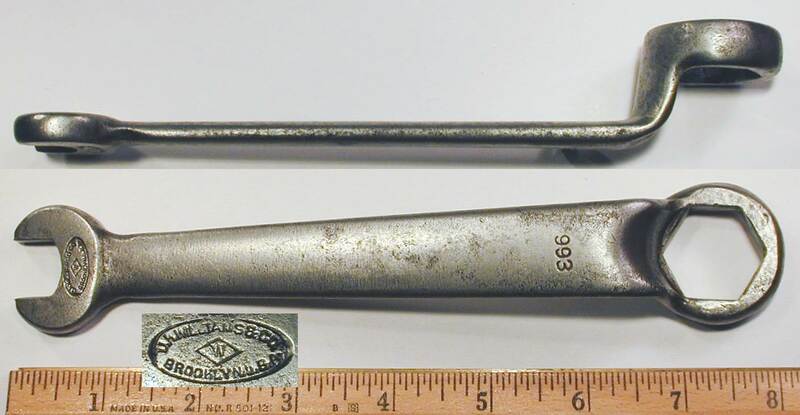 68 shows a Williams 83B 7/8x1 S-shaped open-end wrench, stamped with the JHW-Brooklyn logo on the left face, and with "83B" on the right face, and with the W-Diamond logo forged into the shank. The reverse faces are unmarked. Fig. 69. Williams 683A 15/16x1 S-Shaped Open-End Wrench, with Inset for Marking Detail, ca. 1914-1924. Fig. 69 shows a Williams 683A 15/16x1 S-shaped open-end wrench, stamped with the JHW-Brooklyn logo on one face, and with "683" and the W-Diamond logo forged into the shank. The inset shows a close-up of the stamped JHW-Brooklyn logo on the face. Williams was one of the first companies to offer open-end wrenches with a ratcheting action, made possible by means of a special cut-away opening. 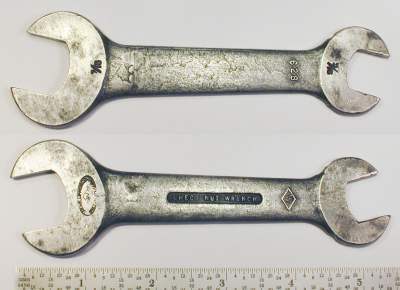 These wrenches were covered by a 1910 patent and were sold under the "Ratcho" brand. Fig. 70. Williams "Ratcho" 1127C 9/16x11/16 Ratcheting Open-End Wrench, with Inset for Reverse, ca. 1910-1915. Fig. 70 shows a Williams 1127C 9/16x11/16 "Ratcho" open-end wrench, designed to give a ratcheting action in one direction. The shank has depressed panels with forged-in markings "J.H. Williams & Co." and "Brooklyn, N.Y. U.S.A." on the front, with "Ratcho Wrench" and "Patd. U.S.A. Apr. 26, '10" on the reverse. The shank also has a W-Diamond logo forged into the front. The patent date corresponds to patent #956,259, filed by G. Amborn in 1908 and issued in 1910. The face markings on this wrench are confusing, as both ends are stamped "3/8" for the size. This wrench is the equivalent of a 27C industry standard size and uses mixed size conventions for the openings, with 3/8 S.A.E. for the smaller opening and 3/8 U.S.S. for the larger. 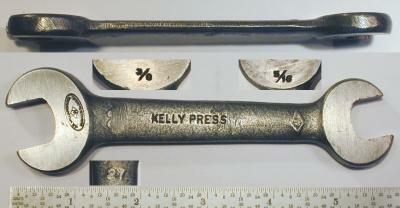 Williams also produced "Ratcho" wrenches in Whitworth sizes, as the next figure illustrates. Fig. 71. Williams "Ratcho" 1125 Special 3/16Wx1/4W Ratcheting Open-End Wrench, with Inset for Reverse, ca. 1910-1920. Fig. 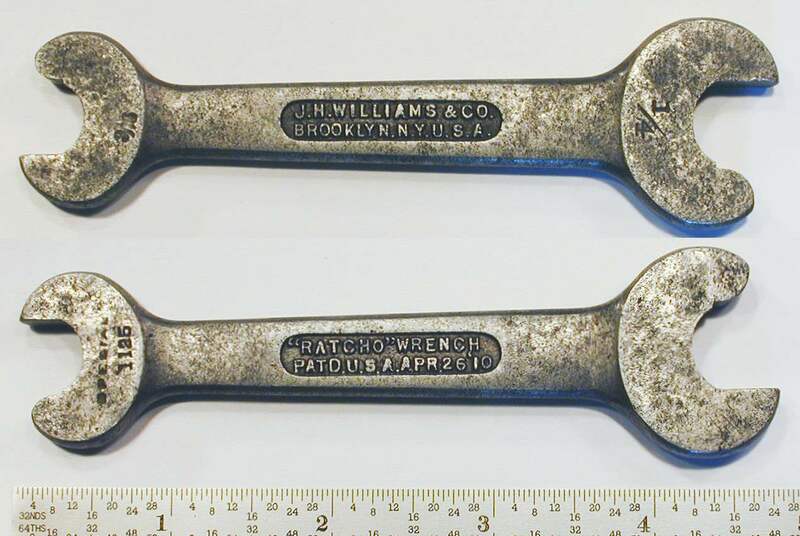 71 shows a Williams 1125 Special 3/16Wx1/4W "Ratcho" open-end wrench with Whitworth sizing, stamped "1125" and "Special" on one face. The shank has forged-in markings "Ratcho Wrench" and "Patd. U.S.A. Apr. 26, '10" on one side, with "J.H. Williams & Co." and "Brooklyn, N.Y. U.S.A." on the reverse. The reverse faces are stamped "3/16" and "1/4", references to the Whitworth sizing convention. The measured opening sizes were approximately 0.45 and 0.54 inches. Fig. 72. Williams "Ratcho" 1729 5/8x3/4 Ratcheting Open-End Wrench, with Inset for Reverse Detail, ca. 1915-1920. Fig. 72 shows a somewhat later Williams 1729 5/8x3/4 "Ratcho" open-end wrench. The shank has depressed panels with forged-in markings "J.H. Williams & Co." and "Brooklyn, N.Y. U.S.A." on the front, with "Ratcho Wrench" and "Patd. U.S.A. Apr. 26, '10" on the reverse. The faces are stamped "7/16" and "1/2", references to the older S.A.E. Size Convention. Fig. 73. Williams "Ratcho" 1134 7/8x1-1/16 Ratcheting Open-End Wrench, with Inset for Reverse, ca. 1915-1920. Fig. 73 shows a Williams 1134 7/8x1-1/16 "Ratcho" open-end wrench, marked with "J.H. 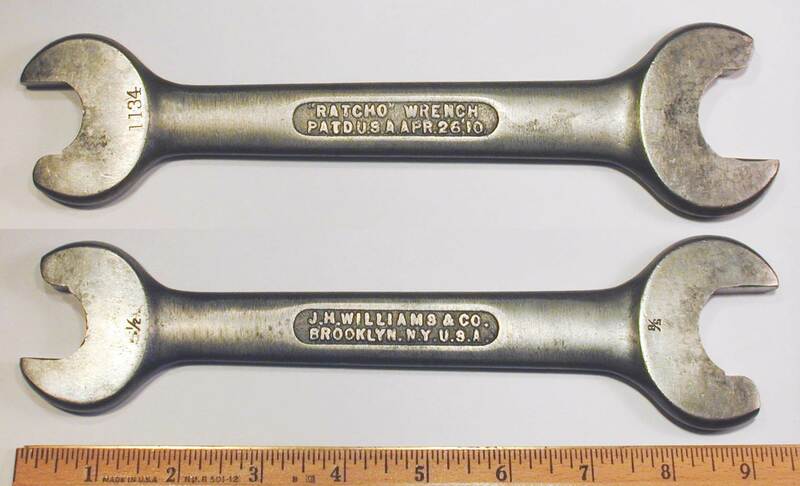 Williams & Co." and "Brooklyn, N.Y. U.S.A." forged into the shank, with "Ratcho Wrench" and "Patd. U.S.A. Apr. 26, '10" forged into the reverse. The faces are stamped "1/2" and "5/8", references to the older U.S.S. Size Convention. Fig. 74. Williams 255A 5/8 Socket Wrench, with Inset for Marking Detail. Fig. 75. Williams 969A 5/8 Socket Wrench, with Insets for Marking Detail. Fig. 75 at the left shows a Williams 969A 7/8 offset socket wrench, stamped "J.H. Williams & Co." with "969A Offset" and the W-Diamond logo on the reverse. The bottom of the socket also has a forged-in "969A" model number. Fig. 76. Williams 993 9/16x7/8 Spark Plug Wrench, with Insets for Side View and Reverse Detail, ca. 1914-1924. Fig. 76 shows a Williams 993 spark plug wrench with a 7/8 hex offset box end and a 9/16 open end. The wrench is marked with the "993" model number and W-Diamond logo forged into the shank, and with a small JHW-Brooklyn logo stamped on the reverse face. The model 993 wrench was listed in the J.H. Williams Fifteenth Edition catalog of 1912, with the 7/8 opening noted for use on a size 1/2 spark plug. The list price was $0.60 semi-finished or $0.80 finished with lacquer. Fig. 77. Williams 993 Special 9/16x15/16 Spark Plug Wrench, with Insets for Side View and Marking Detail, ca. 1914-1924. Fig. 77 shows a later Williams 993 spark plug wrench with a 15/16 hex offset box end and a 9/16 open end. The wrench is stamped with the JHW-Brooklyn logo on the face, with the "993" model number on the shank. The Williams 17th Edition catalog from around 1919 lists three models of spark plug wrenches, but the opening sizes for this wrench don't match any of the published specifications. The closest match is the model 993A wrench with a 15/16 hex box opening, but this model normally had an 11/16 open end. It's possible that this example was made as a special order. Around 1920 Williams acquired the Whitman & Barnes Company, the maker of the well known "Bull Dog" line of alligator wrenches. Williams continued the production of the Bull Dog wrenches at least into the 1950s. Fig. 78. Williams No. 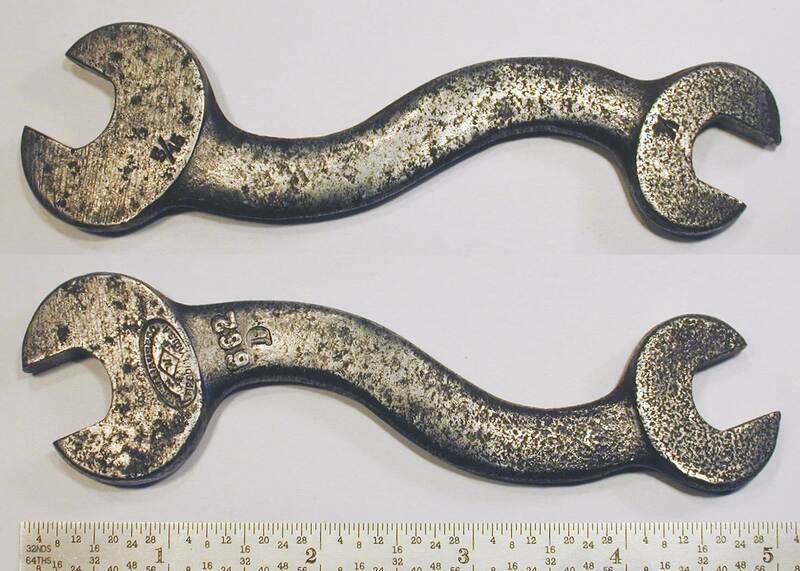 2 Bull Dog Wrench, with Inset for Reverse Detail. Fig. 78 shows a Williams No. 2 "Bull Dog" wrench, a tool with serrated teeth in a tapered opening, sometimes called an alligator wrench. The shank has forged-in markings "Drop Forged in U.S.A." with the W-Diamond logo, with "J.H. Williams & Co." forged into the reverse. The overall length is 9.1 inches, and the finish is plain steel. The "Bull Dog" brand of alligator wrenches was originally produced by the Whitman & Barnes Company (W&B), which was acquired by J.H. Williams around 1920.